Choreographer Leo Mujić, creator of the ballet "Gospoda Glembajevi" will be working on the Eurovision choreography for the Croatian entrant Roko, reports Jutarni List. Mujić is currently the choreographer of the rock-opera "Jesus Christ Superstar", which will be premierred on March 23 with Jacques Houdek playing the role of King Herod. After this cooperation, Roko's Eurovision mentor invited classic ballet choreographer to enhance movements of Roko on the stage. 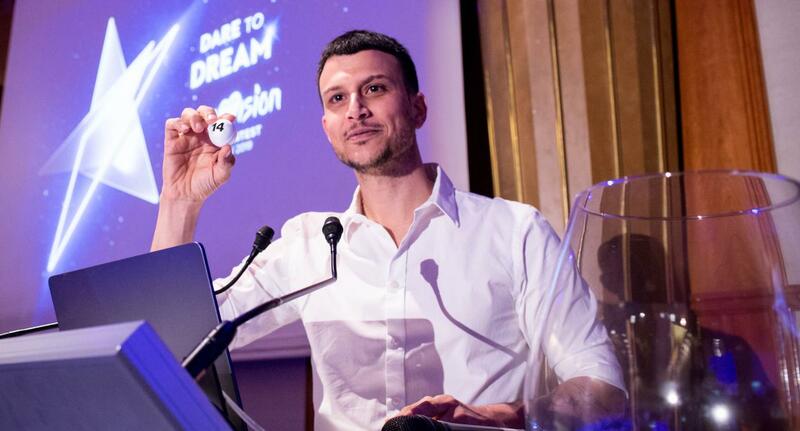 "Eurovision is a show that I do not watch for many years, but in childhood I followed it, at a time when it was a must-be, window into the world", admits Mujić. 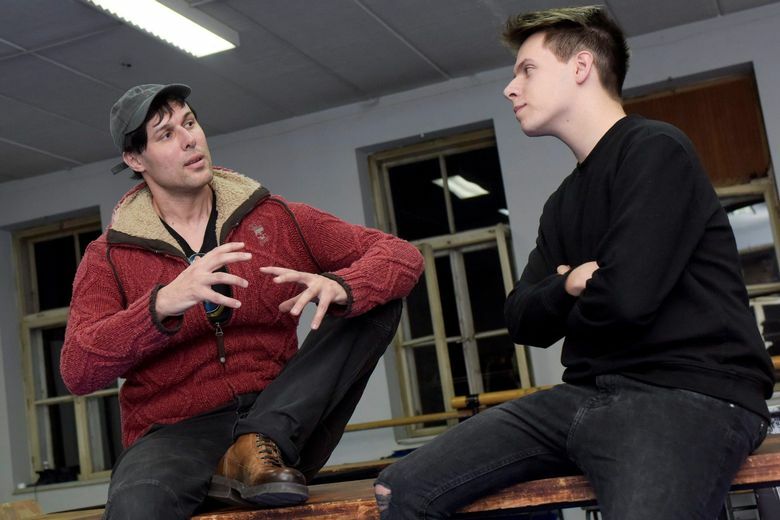 He explains they will not be adding ballet dance into the performance: "I only improve Roko's movements, stage habit, holding back, reactions to the particular part of the lyrics. There will be some surprises in the performance, which I will not talk about for now". Mujić characterizes Roko as intuitive and intelligent student, talented both vocally and in the stage presence. "In my work, the genres are different, but quality is a universal and omnipresent goal, be it ballet, opera or Eurovision. I am concerned that my country is well represented at the Eurovision". "Me and my Eurovision team were looking forward to reaching 1 mln views on Youtube. And our joy was indescribable when we saw in less than a week how the song "Walking Out" was loved, spread into the continents. It was surprising that after 1 mln, the figure reached 2.5 mln in one hour and continues to grow swiftly. We have already contacted the official channel of the Eurovision Song Contest to find out if there is any problem behind the fast growing indicator. I will certainly notify you of the news". Recall that in 2013, such suspicions were presented against the representative of Belarus Alyona Lanskaya, whose music video collected a million views on Youtube in one day, and very small figures before and after that. No action was taken on this matter. Rehearsals of the staging of Sergey Lazarev and his Swedish backing vocals team continue in Moscow. In an interview to Yedioth Ahronoth Kobi Marimi has responded to the divided reviews about his entry "Home". "Maybe a few years ago I could not cope with such harsh reactions," Marimi says, "but I came to the program at the age of 27 and went through a mental process to deal with such reactions. I do not want to prove something to someone who writes against me, I prefer to focus on music and what is going to happen on stage. " "At first, Neta Barzilai also received harsh reactions about Toy and we all know what happened at the end," he says, adding that betting odds will also change a lot after the stage presentations will become known. However, he is pleased with those reactions which rated the song positively. "I was amazed how the important message of the song went through, a message of empowerment," said Merimi. "Anyone who knows me a bit and follows my story in the Next Star can understand how important the song is to me: every person who has experienced something in life who was told that he is not good enough or thought he has no place in the world can connect to the song," says Marimi. Only a month ago, Marimi was chosen to represent Israel in the Eurovision Song Contest, after winning the "Next Star" final. "I did not sleep for five days, only here and there for an hour or two," says Marimi. "I did not say it was hard for one second, it was fun, I dreamed about it. To represent my wonderful country is a great honor". Unlike many contestants, Marimi reveals that he did not imagine his victory in the final and has not even celebrated it until today. "I do not know how it's possible to settle with such things. It's like if it is someone elses name Kobi Marimi and he won the show. I wanted to go to this kind of program for many years". Even though he reached the final, Marimi reveals that he wanted the Shalva band to win "I did not think about winning in the final, I myself would vote for the Shalva band, it hurted me when they retired... Many people say to me, 'We knew you would win.' "I received a lot of compliments on the street, but I never knew how to compare to some other contestants, I knew that apart from going up and singing and giving my all, I had nothing to do." 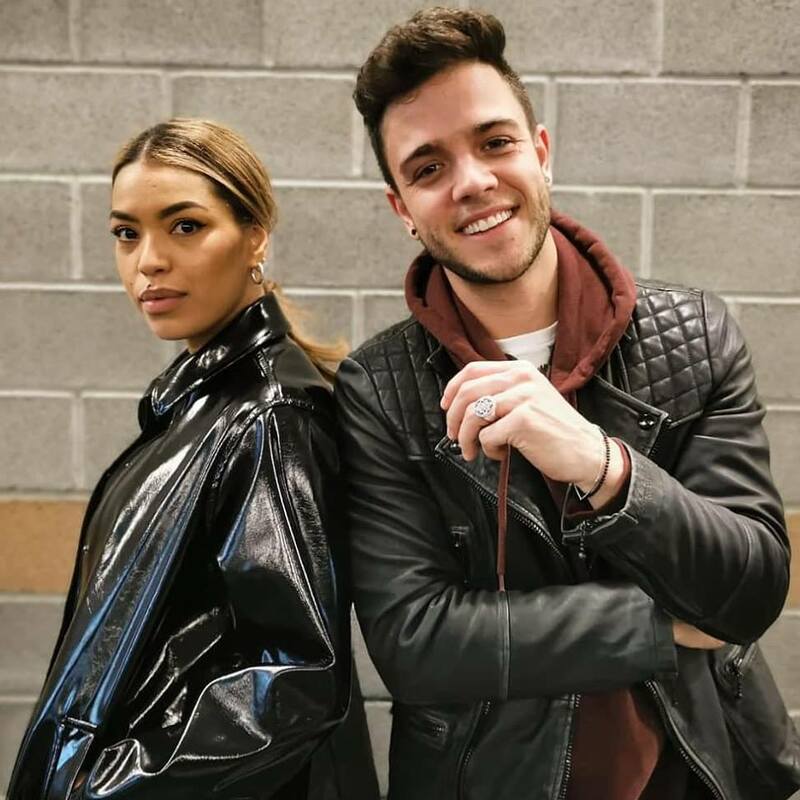 Sacha Jean-Baptiste will become creative director of the Swiss performance in the Eurovision 2019 by Luca Hänni. Choreographer India Rischko will also be part of the team. In an interview to Nezavisen vesnik, North Macedonian entrant Tamara revealed details of her preparations to the contest. "It's really a great honor. With over 150 million viewers around the world, "Eurovision" is the most watched television show in the world and our chance to show the world what we know and what we can", she explains. "It was the most important step for us to find a good song. We received hundreds of excellent compositions from songwriters from our country and international, but after the first listening to "Proud", I immediately knew that it was the song I want to sing in Israel. "Proud" is more than a song. It is a call to everyone to believe in themselves and not to give up their own dreams. With the song, we want to inspire people to be proud of themselves and to live their lives according to their own rules. That's why we decided that the message will reach most people if we sing the song in English and I think we have made the right decision", says Tamara. Singer will be joined on the stage by three backing vocalists Aleksandra Janeva, Antonia Gigovska and Vasil Garvanliev. Aleksandar Noshpal will take care of the style, while Swedish team is working on the staging of the entry. "I am happy to have an excellent team beside myself. Thanks to them and their dedication, this year my main task is to sing the song as best I can, and of course, I will do it". "All my life I have been surrounded by successful women. I am proud of my mother who was always beside me and believed in me even when I did not believe in myself. I am proud of my sister and my friends because they teach me to be a better person every day. I am proud of all women who live their lives according to their own rules. Our time is coming. I also have a wonderful husband and two wonderful children who are the center of my life. 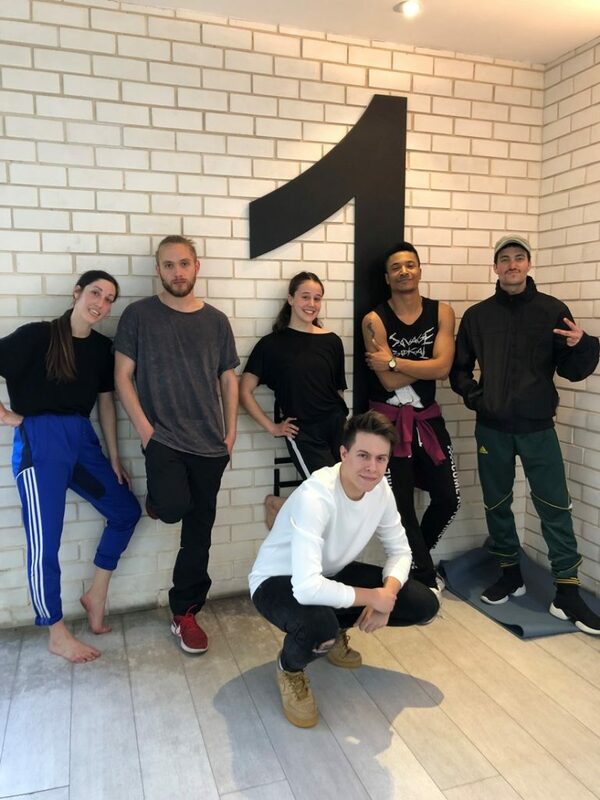 I have a family that is always beside me and fans that I am extremely grateful for daily making my dreams the reality"
Swedish performers Adam Svensson, Jennie Jahns, Erik Segerstedt and Simon Lingmerth started rehearsals for Sergey Lazarev's stage presentation for Eurovision 2019. Adam and Jennie have already performed with Sergey at Eurovision 2016. The stage performance is directed by the Greek director Fokas Evagelinos, who this year is also working on the staging of Spanish entry. 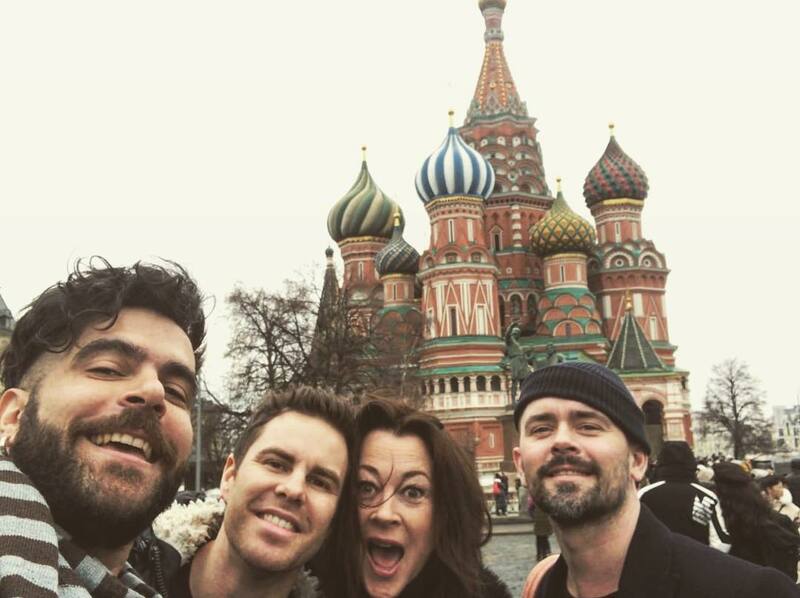 Rehearsals are held in Moscow, where all the 'Dream Team' members have gathered. Adam Svensson is more known to fans of Melodifestivalen and Eurovision as a in-house dancer. In 2016, he performed at Melodifestivalen as backing vocalist for Samir & Viktor's "Bada Nakna". He is currently the soloist of the Swedish dance band Highlights. Jennie Jahns is the backing vocalist with the greatest experience of performing at the Eurovision, who has repeatedly (2012-2014, 2017) been involved in the entries of the representatives of Azerbaijan. In 2016 she performed with Sergey Lazarev. On Melodifestivalen 2017 she performed together with Owe Thornqvist. Eric Segerstedt is known to fans of Swedish music as one of the EMD members. The group participated in the Swedish Melodifestivalen 2009 with the song “Baby goodbye”, finishing third in the final. In 2013, he returned to the competition in a duet with Norwegian Tone Damli with the song "Hello Goodbye" and qualified to the Second chance. At the Melodifestivalen 2017, Eric performed backing vocals for Robin Bengtsson, Anton Hogman and FO & O and two months later accompanied Robin behind the stage at the Eurovision 2017. Simon Lingmert took part in Swedish Idol 2010. In 2014 and in 2015, he was in-house backing vocalist for Melodifestivalen. Tracker of preview videos releases: 08/03: Austria, Ireland, Czech Republic, Azerbaijan, Macedonia, 09/03: Russia, Montenegro, 10/03: Romania, Malta, Armenia, Israel, Albania, 11/03: Moldova. Tracker of single releases: 08/03: UK, Macedonia (karaoke), 09/03: Russia, 10/03: Romania, 14/03: Slovenia, Albania. Latvian entrants Carousel are working on our album and getting ready for Tel Aviv. Check how official photoshoot for the Eurovision Song Contest promotional photos went. Swiss artist Luca Hänni has traveled to Tel Aviv to record his Eurovision Song Contest postcard. Singer was interviewed by Reshet 13 channel at the famous, 14-km long sandy beach. Luca says that the city is already in Eurovison fever: "The inhabitants are full of anticipation and are very proud of hosting." There is sunshine and the mild temperatures of 20 degrees: "I do not really miss the weather at home," Bernese laughs. There has been no time for sightseeing yet, only a small culinary journey with falafel and hummus, but Hänni looks forward seeing more of the city: "I am sure that Tel Aviv still has many beautiful places to discover!". 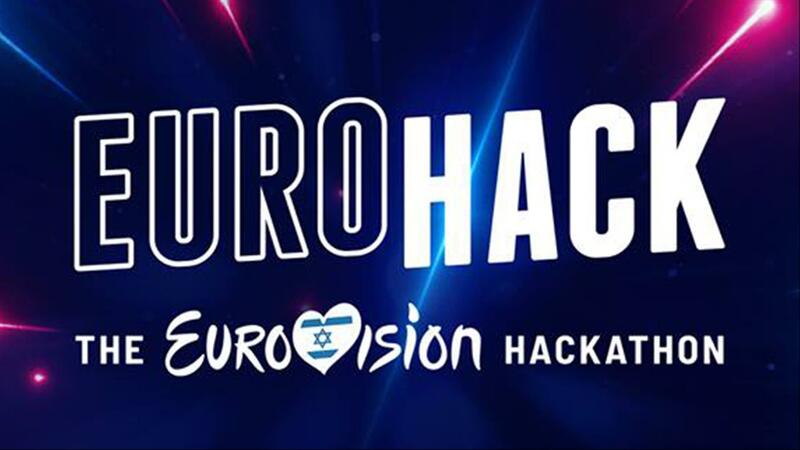 EuroCafe of the Eurovision 2019 will be located in Ha-Oman 17, the biggest and most advanced night club in Israel, and will operate from Sunday (May 12th) and up to Saturday after the finals. 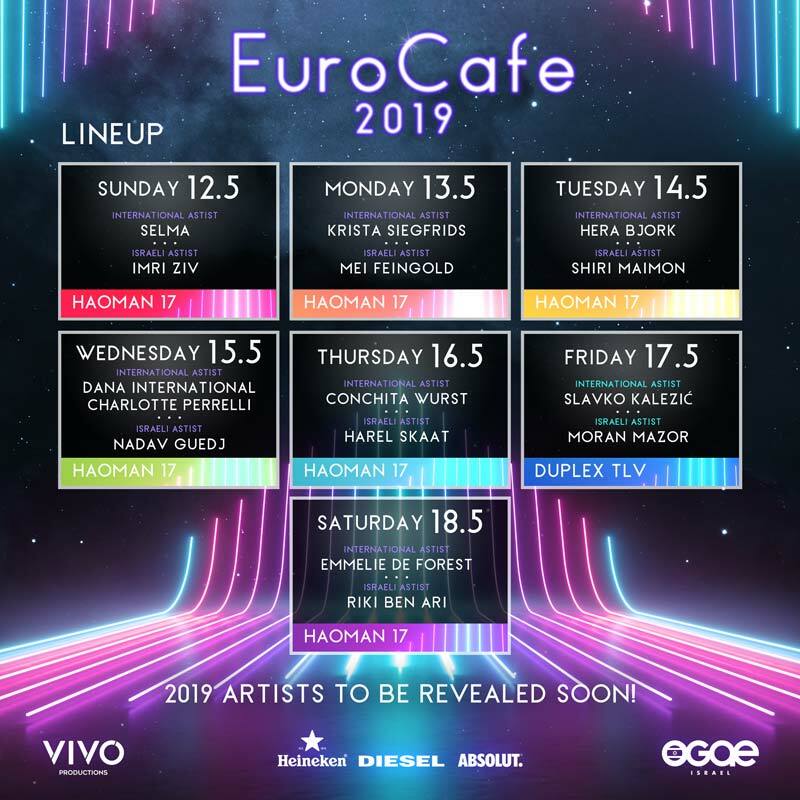 EuroCafe is being set up by OGAE Israel together with VIVO Productions (working on shows of Offer Nissim and Pride week events in Tel Aviv). Guests of shows will be competing acts of this year, exciting names of former artists and local stars. Antonia Gigovska has been confirmed as backing vocalist for Tamara Todevska at Eurovision 2019. She was also part of the Eurovision Song Contest last year, joining as backing singer band "Eye Cue". Recently she has set off her solo career with couple successful single releases and a victory at the Macedonian and Romanian music festivals. She is also performing in Pinkove Zvezdice show. 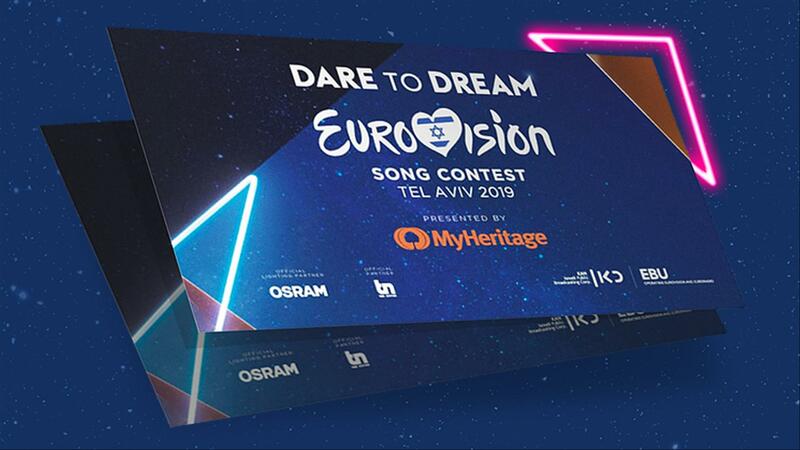 The Israeli Police is demanding an additional NIS 10 million (EUR 2.5 mln) from the broadcasting corporation and the municipality for the Eurovision 2019 for the provision of its security services, reports Timeout. At the same time, the corporation and the municipality are not planning to finance the police's demands from their budget, and they transfer responsibility to the Prime Minister's Office, which promised, according to the corporation, to finance the security of the event from a separate budget. The police's new demand is not related to the Eurovision event itself, but to other events that will take place throughout the city, including the Eurovillage. In addition, the additional budget should be used to reinforce police forces throughout the city for security, traffic regulation, and the like. This is in addition to the strict security at the site of the event itself at the Tel Aviv Expo, the cost of which was budgeted by the corporation in advance at NIS 10 million. This system will be operated by an external company hired for this purpose by the corporation. KAN makes it clear that it does not intend to finance the additional security expenses demanded by the police, and that they expect the Prime Minister's Office to fulfill its obligations to devote a separate budget to the subject. The municipality is believed to have a similar opinion. However, KAN adds that discussions are being held between the parties and that they hope the crisis will be resolved soon. The police commented on the publication: "Contrary to what is claimed, the amount demanded is significantly lower, and the production and the corporation knew this very well, it is similar to other events of a similar magnitude and the budgetary requirement was transferred more than a month ago by the relevant bodies. In events of this magnitude, there are many complex security aspects that should be considered, the intelligence picture, the nature and extent of the event, the composition of the participants of the event, the conditions of the physical environment and the like. We will continue to work, together with all relevant officials, to advance the issue and to complete the operational preparations and activities required for the Eurovision events. ". 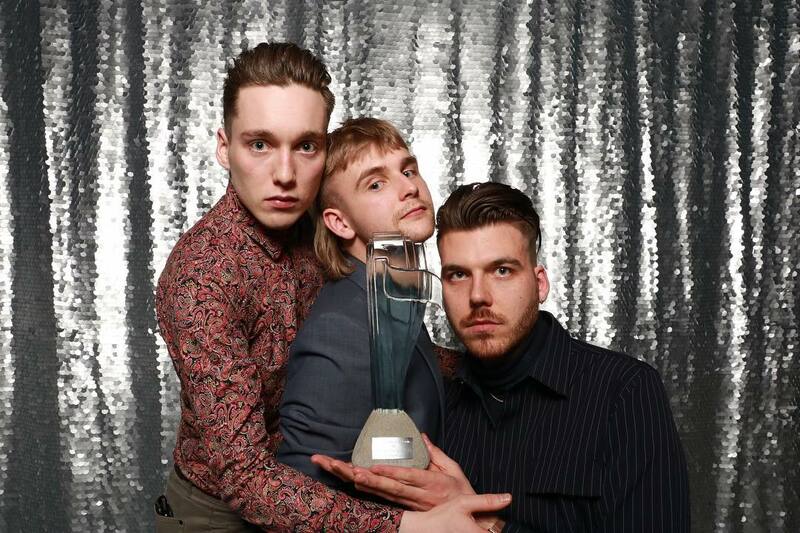 The band Hatari, which will perform for Iceland at this May's Eurovision Song Contest, was last night named Act of the Year in the pop, rock, rap, and electronic category at the Icelandic Music Awards. Skipping the usual acceptance speech conventions, bandmembers instead jumped right in with a political message to the country's prime minister. Matthías Tryggvi Haraldsson said on stage that Hatari are enthusiastic supporters of Iceland's Vinstri Grænir (Left Green) prime minister Katrín Jakobsdóttir, but that it is now time for her to declare whether or not Iceland truly belongs to the group of countries with human rights, democracy and equality as their guiding principles. "We're a little confused," he admitted. His comments are widely interpreted as a reaction to this week's ruling by the European Court of Human Rights that Iceland's justice minister broke the law when choosing which judges to appoint to the new Landsréttur appeals court, which came into existence at the start of last year. The court also criticised Iceland's parliament, president and Supreme Court for not preventing the minister's breach of the law guaranteeing people a free and fair trial. The minister stepped aside yesterday, but many of her supporters within Sjálfstæðisflokkurinn (the Independence Party) blame the European court rather than the Icelandic politicians. Prime Minister Katrín is under pressure to bring both sides together, but it could prove difficult for her government to criticise and appeal against the ruling at the same time as welcoming it and taking steps to rectify the weaknesses it highlights. The statement from Hatari was characteristic of the intelligent and politically-minded musicians who are entering Eurovision, where overt political statements are against the rules. 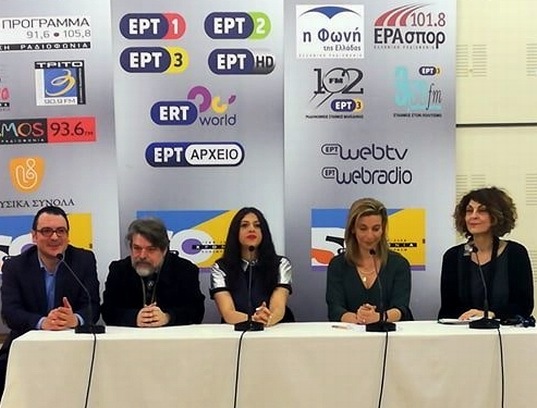 Greek delegation has held Eurovision related press-conference which took place in the Studio E of the Radiomagora of Agia Paraskevi. Conference was attended by the Head of the Delegation, Maria Koufopoulou, ERT's Corporate Communications Director Panagiotis Tsolias, ERT Head of Press for this year's contest Irini Giannara, Managing Director of MINOS EMI / Universal Margarita Matsa, Greek representative Katerina Duska, Alexia Stournara on behalf of the recording company MINOS EMI / Universal, the CEO of ERT, Ioannis Drosos, the Chairman of the Board of Directors of ERT Dimitris Papadimitriou, ERT Eurovision Commentator Maria Kozakou, one of the composers of "Better Love", Leon of Athens (Timoleon Veremis), and Stage Director for the Greek performance Efi Goussi, report OGAE Greece and Eurovision Fun. Panagiotis Tsolias, on behalf of ERT, once again stressed that mission of the Greek delegation this year is to bring the victory. Dimitris Papadimitriou explained how the national selection process has worked, pointing out that his experience he had gained in the past Eurovision involvements helped a lot in this year's procedures. He clarified that the committee's main priority for this year was to find a decent and artistic entry and Katerine Duska was his personal proposal. He thinks that selection of Duska opened Eurovision to the independent music scene of Greece, which presents amazing opportunities. He added that national final remains an option for the future, but he thinks that it would be difficult to attract artists with such quality as Duska to compete in it. Katerine Duska said she feels very honored by the proposal of ERT and thanked for the confidence in her. She said the Eurovision team is all joined by common axis and they work unstoppable hours for the best possible result on this fascinating journey. She feels very optimistic and faithful to the end result, although everything will be judged on the stage of the contest. Her favorite entries this year are the Netherlands, Italy and Portugal, while she also loves Tamta with whom they support each other. Contrary of what was mentioned earlier, Duska will attend several European promotional parties and she likes the opportunity to show her vocal skills. Margarita Matsa said that Katerine Duska's choice was an unpredictable surprise for the record label, and their goal is not to win specifically, but to re-introduce Greece dynamically in the Eurovision world, a contest that named as "artistic sports"! She believes Eurovision can provide a huge opportunity for a European career for Katerine. Maria Koufopoulou spoke about Heads of Delegation meeting and stated that the Israelis were preparing a great event. In regards to the postcard filming, here is no set date, as some of them have been rescheduled, and according to the initial plan, shooting should have already taken place. 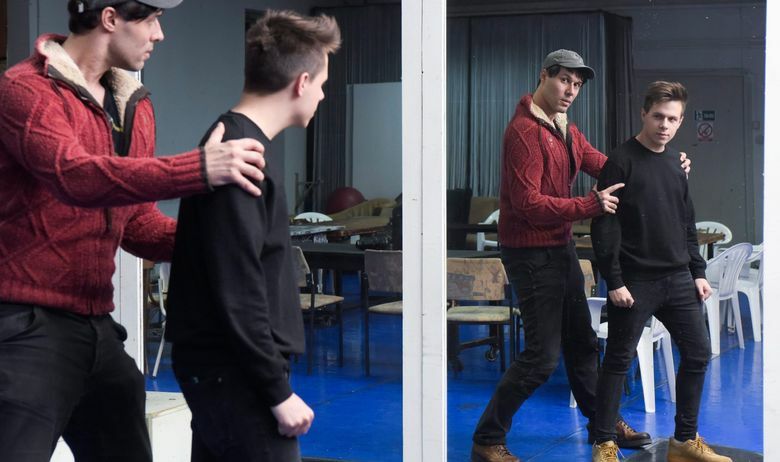 Efi Goussi stressed that in the stage performance of the Greek act the theatrical style will prevail as it could have been felt in the music video. Eurovision tickets sale will resume today at 17:00 CET. Tickets are available for purchase through the Leaan website, the official ticket provider of the Eurovision 2019. As part of the current round of sale, tickets will be offered for the semifinals and for all dress rehearsals. 220 tickets for the final show returned to "LEAAN" will be offered in the next round of sales in April. In this round, final tickets will only be sold at Green Room VIP. Before going to an international tour to promote "On the Sunday", Ester Peony, Romanian Eurovision representative, spends much of her time meeting the audience in Romania. The artist was already present at Pulse de Zilei and Telejurnal Matinal and these days she attends the radio studios. The week began with meetings on ProFM and Bucharest FM, on Friday morning she will be present at Digi FM and next week she will appear on Magic FM. 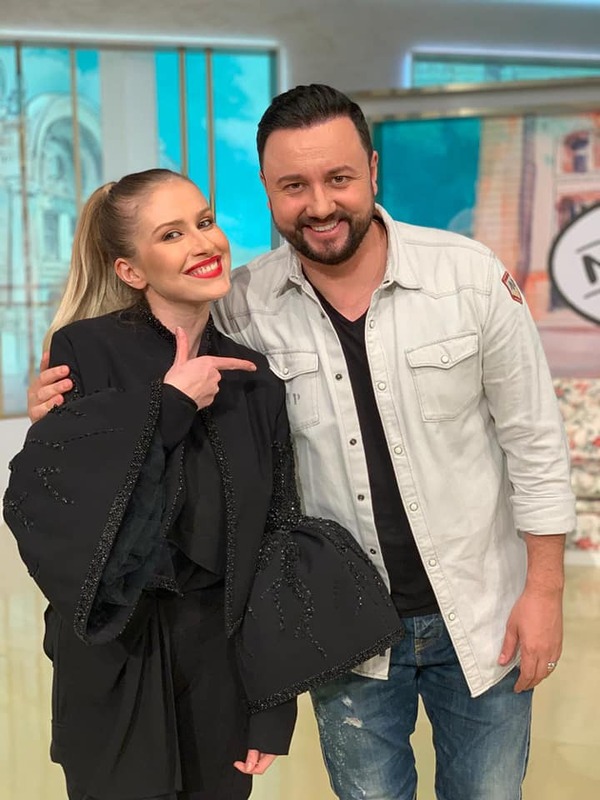 Also on Thursday, Ester will be guest of Catalin Măruţă's show on ProTv at 15.00. 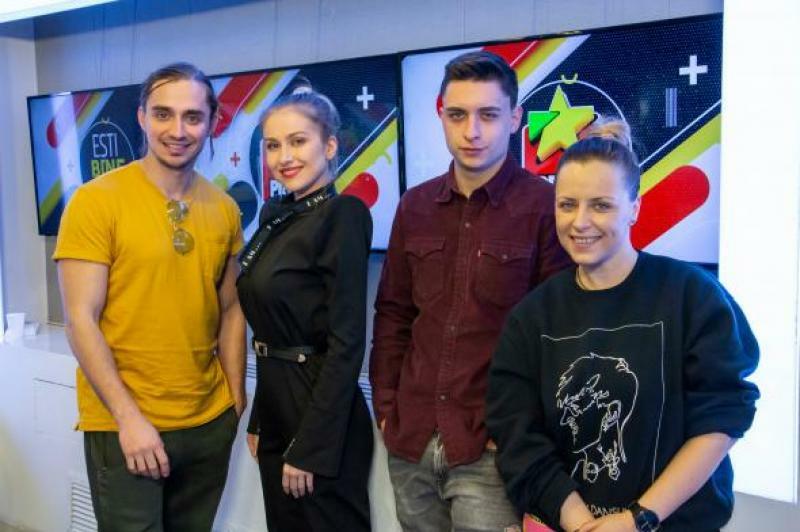 Ester Peony, the winner of the national Romania preselection, accepted the challenge at Dimineața Blană of Pro FM radio to pass a test on the Eurovision Song Contest knowledge. Prior to that, she sang an acoustic version of her song "On a Sunday". Many have wondered where the stage name Ester Peony comes from. Ester Alexandra Creţu explained: "That's what my mother thought of naming me, and Peony comes from peony in English, because mother's name is Bujorica, Peony. I just wanted to make a connection between myself and her. I spent 5-6 years in Canada, I went to school there. Little by little, my mother sent me to singing, that's what happened after I left for Canada in 2001. The first hour of singing was with a jazz singer who taught me different techniques. Easily, I began to listen to a lot of music and inspire myself from different artists so that I could become an artist as well". Speaking about "On A Sunday" she said: "It is my first Eurovision attempt. I believe very much in this song and as far as I hear from other countries, many are radio songs, just like mine". In the Eurovision Quiz hosts Mădălina Petre, Sebastian Coţofană and Radu Ţibulcă sang some refrains of the songs with which the Romanian artists participated along the time in the contest. 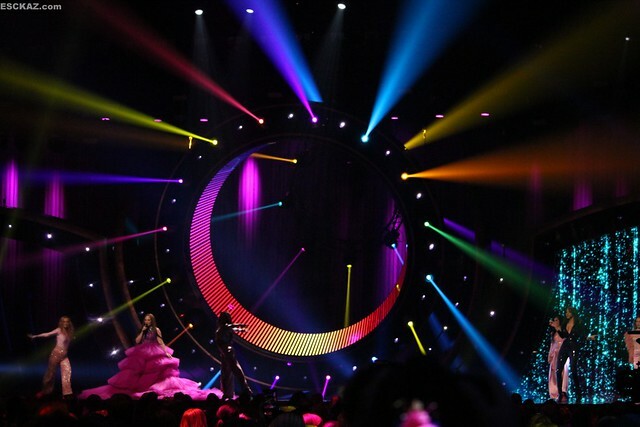 Among the chosen songs were entries by Dan Bittman, Luminița Anghel & Sistem, Elena Gheorghe, Mandinga. You can see how Ester did here. Norwegian broadcaster NRK has invited public to attend filming of preview show Adresse Tel Aviv. Shootings will take place on March 26, 17:45, March 27, 17:15, March 28, 16:15 and 19:15 at NRK Marienlyst in Oslo. Those who wishes to attend recording need to fill in this form. "We are really looking forward to spending some pleasant hours with the enthusiastic fans", says Stig Karlsen. Noel Curran, CEO of the EBU, the European Broadcasting Union, sent a firm letter to Minister of Finance Moshe Kahlon urging him to immediately transfer NIS 70 million to the broadcasting corporation KAN in order to deal with the cost of hosting of the Eurovision Song Contest in Israel, "I urgently write to you as CEO of the EBU, representing 117 public broadcasters in 56 countries, regarding the funding of the Eurovision 2019. Unfortunately, we found that, contrary to previous statements made during our meetings in Israel, The NIS 70 million that you were supposed to transfer to KAN for the Eurovision financing were transferred to the corporation only through a loan spread over 15 years", quotes newspaper Haaretz. Curran made it clear in his letter that the failure to transfer the budget to finance the Eurovision is a concern for the EBU. "The extreme change in the funding of the contest is particularly worrisome because it could significantly harm the ability of KAN to function as a public broadcasting body.". "The government's funding decision threatens ability of KAN to carry out its obligations under the law, with an emphasis on producing a rich and varied programming on the various platforms, in order to benefit the Israeli public, as stated in the Public broadcasting law. You have to make the financing decision and fulfill the promise of funding the Eurovision security as well as the safety of the KAN corporation so that we can continue to work smoothly on the event that will shine Israel in a great light around the world. ". This is not the first time that the EBU has sent a letter in this spirit. Jon Ola Sand, the supervisor of the Eurovision Song Contest, sent a harsh letter last month to Prime Minister Benjamin Netanyahu, protesting against the fact that the budget for security arrangements for the Eurovision Song Contest has not yet been provided. The main producer of Eesti Laul Tomi Rahula has attended Heads of Delegations meeting to set the latest plans for the Victor Crone staging and other items, such as postcard filming. "Will Saara Kadak come to Tel Aviv? We can not answer this today", Tomi laughs and says it should become clear in two weeks time. "We still do not know exactly how our staging will look like. We had to send out the materials and this weekend the EBU people will meet with those who work on the stage production. At the beginning of the next week we will get more information and then we will make some decisions. Picture should become clear by the end of March" says Rahula Õhtuleht, who confirmed that there are two options in the staging. "We still have thoughts in the same direction, and the staging will go on the same topic, but we want to improve it. The song itself is the same, we did not change it, but we had to submit it in separate tracks". Victor will film his postcard in early April. In fact, he should have done that already in March, but the weather in Israel was a bit poor. "They have got a special place for us and couldn't do it because there were rainy weather in the meantime." "I came home from Israel on Monday night because my today's Moscow flight was cancelled and I had to come at night because I need to be in Tallinn tomorrow, but assistant Laura-Liisa is still there and went to see the venue," explains Tomi. "This exhibition center is still an empty box where nothing has been built, but next week the first truck will go there and start building everything. It will be quite exciting.". In addition, work is already underway on next year's "Eesti Laul". "We are working on a new set of rules and we want all things to be fixed in the spring to make it easier in the autumn. By the end of April, I would like to do a lot of things". Madonna's Eurovision appearance is in danger - because of the content of one of the song she has suggested to perform. Ynet portal has learned that Madonna's representatives sent a list of songs that she is expected to perform on stage in Tel Aviv - and one of them (a song that was not released yet) was considered controversial by the production officials. The director general of the public broadcasting corporation, however, called on them not to interfere in the singer's artistic choice. It has also been reported that earlier in March Madonna has filmed a new music video for a song due to be released next month. A well-known photographer Luke Austin, who has taken part in the shootings commented: "I damn well cried. The song is great. The video is political. The video will be controversial. She was brilliant". It is not clear whether the video corresponds to the questionable song Madonna wants to perform on the Eurovision stage. In any case, the production team of the Eurovision Song Contest in Israel has a backup plan in the event that Madonna's peformance eventually will not take place. Broadcasting corporation KAN, in collaboration with BLEE Hackathons invites developers, designers, entrepreneurs and creators to participate in a two day development and innovation marathon - "EUROHACK - The Eurovision Hackathon" aimed for developing and creating accessibility solutions and a viewing experience for the Eurovision Song Contest, with tickets to the Eurovision Song Contest as prizes for the winning teams. It will take place on Thursday, April 4, and will continue until midday Friday, April 5th. in the Microsoft Reactor space in Tel Aviv. Designers, encoders, developers, entrepreneurs, who want to give their talents and abilities for the Eurovision Song Contest are invited to attend. 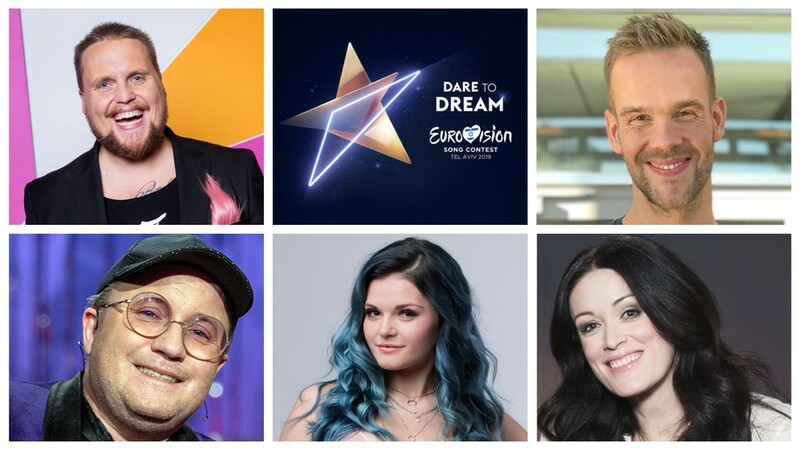 There will be two major challenged: KAN accessibility challenge - the improvement of accessibility solutions for viewers with disabilities and OGAE Experience Challenge - perfecting and maximizing the viewing experience of the Eurovision Song Contest for the fans around Europe. At the end of the event, a panel of judges, composed of senior members and decision makers of the partner companies, will select the ten projects that met the criteria in the best possible way. During the three weeks following the event, the selected teams, supported by the mentors, will work on developing their solutions, both technologically and in a business scheme, to bring them to the implementation stage. The ten teams will present their project in a festive event on Tuesday, April 30. The teams will be scored in the Eurovision format of 1-12 points, and at the end of the event the winner will be announced. 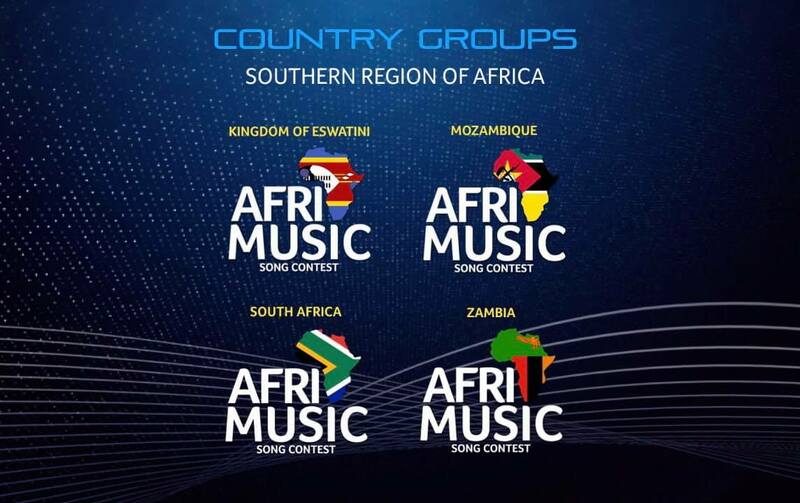 Contestants from the 16 Countries of African Continent have submitted entries for the second instalment of the AfriMusic Song Contest. The entries phase ended on the 17th February 2019. South Africa and Ghana have submitted the most entries followed by Nigeria and the Kingdom of eSwatini. Compared to last year, no entries were received from the Central African Republic, Chad, Democratic Republic of Congo, Egypt, Ethiopia, Gabon, Guinea, Tanzania and Zimbabwe. The competition was joined by Liberia, Malawi, Rwanda, Senegal, Togo and Zambia. After 2 weeks of reviewing and preparing all the entries for the National Selections, the AfriMusic Song Contest organisers had all entries vetted, to ensure that the entries complied with the contest rules and regulations. Entries from 13 out of 16 Countries have been confirmed for the participation, unfortunately entries from Togo, Liberia and Botswana were not able to proceed. The organisers of the contest said that the response from artists across the continent was overwhelming and the vetting process successful. 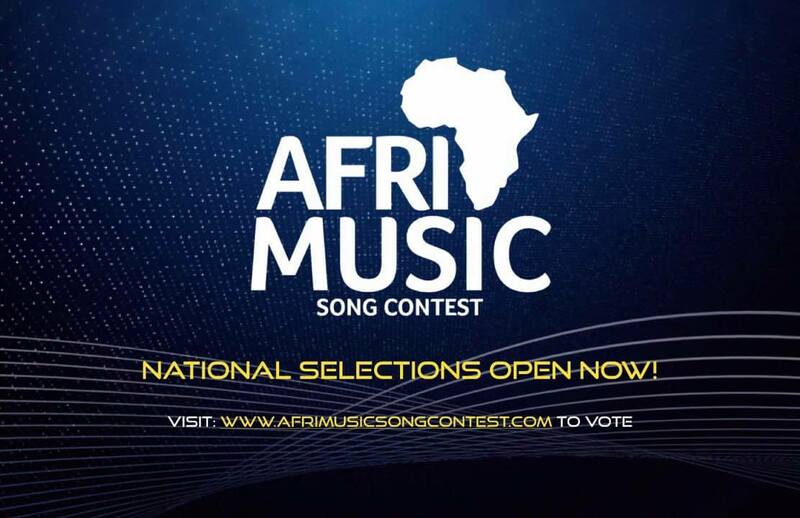 The 10 highest voted for songs from this region will compete in the AfriMusic Song Contest finals. 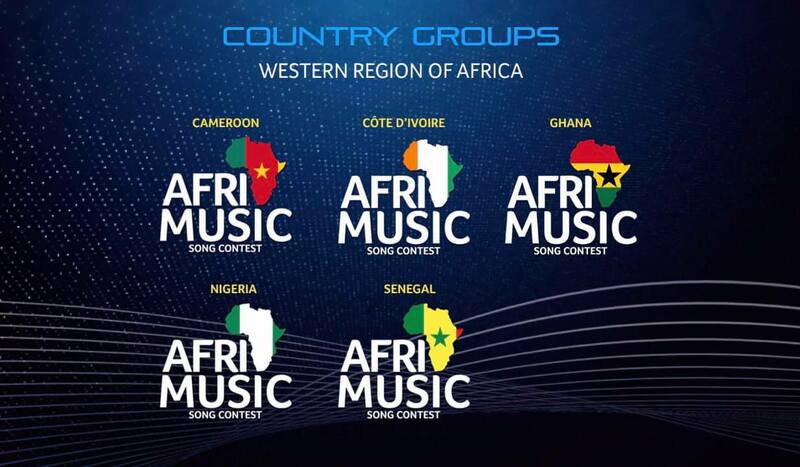 The 2 highest voted for songs from this region will compete in the AfriMusic Song Contest finals. 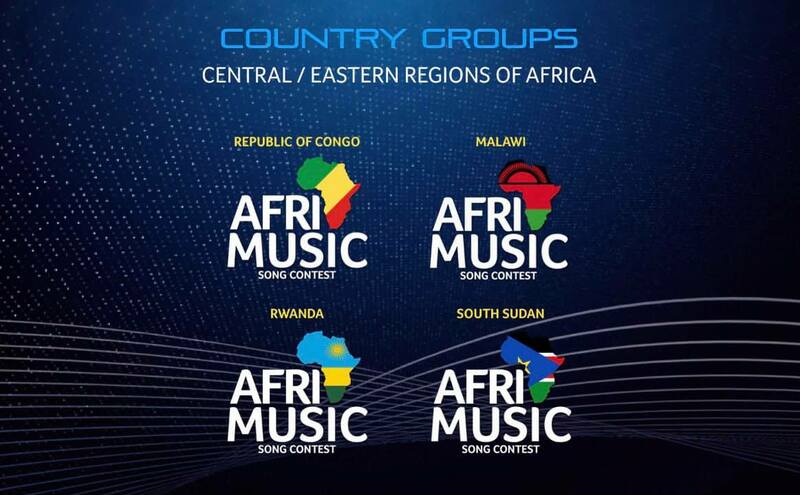 The 8 highest voted for songs from this region will compete in the AfriMusic Song Contest finals. "A total of 20 contestants will be selected based on the number of votes received, to compete in the contest Finals this year. All countries with approved submissions could participate, making the contest fully inclusive, provided that they meet the contest rules and regulations. Currently this method has had a positive response and we are excited to see the results" – said Suzie Vicente, Business Development and Sponsorship Director of the AfriMusic Song Contest. The finalists will be announced and the Final phase of the contest will commence from the 29th March 2019 to the 12th April 2019. The voting process will remain the same as it did in 2018, where all 20 songs get voted for again by the judges and the supporting public. The voting for both the national selections and finals will be tallied on a 50/50 voting process, where judges scores and the public scores are counted. The public and judges will have the opportunity to listen to the approved songs via the AfriMusic digital platforms and will be able to cast their vote for their favourite song. Further information on the process and voting is available on the official website of the contest, you can listen to all the entries also on event's official Youtube channel and cast your vote here. The AfriMusic Song Contest is the largest music competition platform in Africa to include all 54 countries, creating equal opportunities for emerging musical talent throughout the continent. The AfriMusic Song Contest is geared to educate, empower and enable untapped songwriters, composers and singers across Africa, by constructing a positive and confident image of Africa in unity through music, across the continent and on an international stage. Aspiring Africans eager to showcase their talents and represent their country with their musical endevours have now been given an opportunity to enter and put their songs forward. In 2018, Symphony from the Kingdom of eSwatini took the first big win with her song Sengikhona and the contest organisers are very excited to see which artist and country will take the title in 2019. AfriMusic award Symphony with a trip to Lisbon Portugal in 2018, where she got to perform at the EuroVision Village infront of 20,000 spectators and the performance broadcasted live to 186 million viewers on RTP, the public service broadcaster of Portugal. 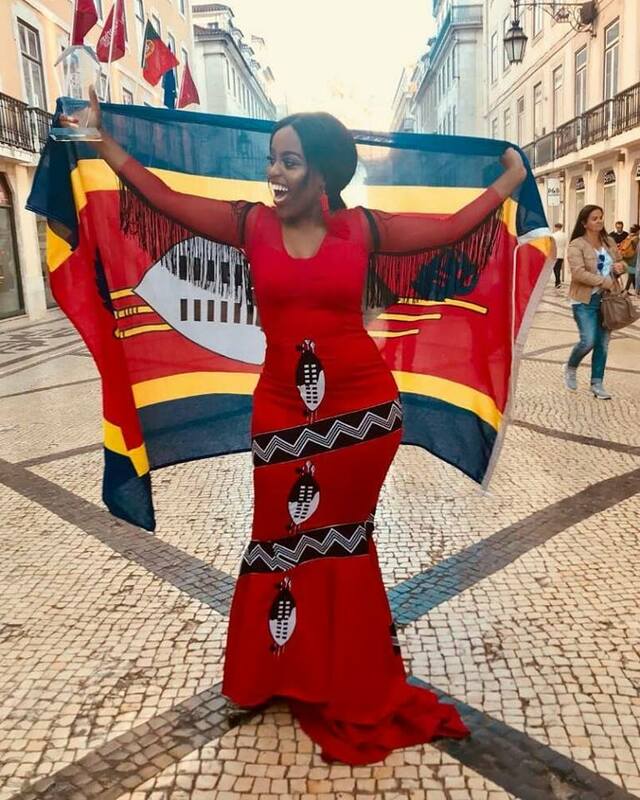 "The trip was a huge success and an eye opener for Eurovision fans, as they welcomed the African beauty on stage and several other venues throughout the EuroVision Song Contest week. The audience excitement when Symphony walked on stage was electric and she represented Africa in an engaging and inspiring manner, fans are now excited to know who AfriMusic will be taking to Europe next," said Managing Director of the AfriMusic Song Contest Michelle Fernandes. Representative of Cyprus Tamta is rehearsing with dancers for her postcard in Eilat. In an interview with Télépro, composer of the Belgian entry Pierre Dumoulin described working with Eliot and plans of preparations for Tel Aviv. "Getting acquainted with Eliot was more or less the same scenario as with Blanche. I came across his audition at "The Voice Belgium", I felt something special... It's the voice that attracts me to artists, but I never look for the perfect technique. An emotion must emerge, there must be a little something that touches me. I do not know how to explain it with words... Eliot has a particular stamp, and a way of putting his voice that interests me. We saw each other, and we wrote two songs together, but "Wake Up" was written before.o I do not compose specially for the Eurovision, the only thing I do is to respect the duration of the song. I always go on instinct by making music that speaks to me and corresponds to me. Quite quickly, when we met, I told him it was a year of RTBF in the Eurovision, and I offered him a try. I wanted to get back there. Eurovision is a parallel world, I even went back to Lisbon last year to relive that atmosphere. He was interested right away. That's what's great with the new generation. Artists of my age have not been rocked by Eurovision. For us, it was not really conceivable to go there openly. The younger ones understood that it is a good way to make themselves known. The song existed as a demo with no lyrics. We sat around the table, discussing ideas, and his wish was to awaken consciences. But all that happened before the protests on a climate in Belgium in February. So we decided to convey this message, the message of a generation that wants to move on. Eventually the jury made its choice among 25 demos. The desire of the Eurovision staging is to repeat the athmospere of the music video but just with 6 people on stage. The screens will be there, and we will perhaps use them, especially since the stage will be gigantic. They will play a role in the performance"
Dumoulin says he also had contacts with Cypriot delegation, and had an offer from them to compose the song for the 2018 contest, but nothing has materialized. "I think it's mainly because I have a particular brand, and I say it myself: the RTBF is very brave to trust me twice in a row like that. My songs are not very formatted, when compared to "Fuego" for Cyprus last year. When I see what they have eventually released, and their song was very effective, I do not know how to do things like that... They are interested in my profile, but would they dare to go to the end?" 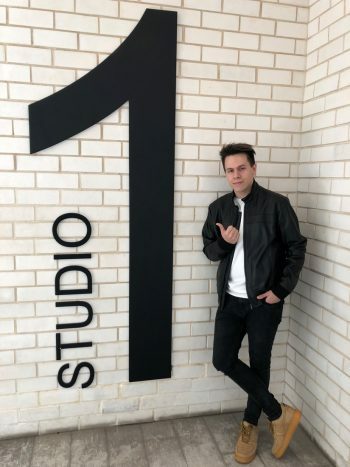 Croatian entrant Roko is nowadays in Israel to film his Eurovision 2019 postcard. - After three days of stay in Israel and Tel Aviv I am overwhelmed by intense preparations, new contacts and work done. I met a lot of people from all over Europe, and the production team at the highest level - I'm thrilled with the work and creative solutions of the official director and all of her associates. We've filmed a postcard that will be broadcast before my show, and for now I can reveal that we've recorded it in a really special place, in several locations, and it will be very imaginative, youthful and dancing, according to the slogan of this section - 'Dancing in Israel! ' The recording was extremely demanding, it lasted from 6 am until late afternoon hours, but it paid off and I can not wait to see the postcard. Israel is a wonderful country and the hosts are excellent - they invest a lot of effort into the whole process, and I was particularly impressed with the fact that our song came with much attention and designed the idea of ​​a postcard detailing the concept of our performance to the finest. I'm proud that they are very fond of the song, as well as the performance from Dora, and we are doing a great effort to upgrade this performance. I look forward returning to Israel in May when I will be most pleased and proud to represent Croatia on the world's biggest music stage! ", Roko said with a joy. He has arrived together with the new head of Croatian delegation at the contest Elizabeth Homsi. Young TV presenter Emma Wortelboer had one dream: to become the spokesperson for the Netherlands in the final of the Eurovision Song Contest 2019. Emma made a series about her Eurovision passion, #EmmaDouzePoints, as part of popular TV show DWDD, in which she was prepared for this task by various song festival experts. And with results, because on Saturday 18 May Emma will indeed deliver the points of the Dutch professional jury. In previous editions, the artist from the previous year has played the role of spokesperson. Waylon, who represented the Netherlands in 2018 and would have traditionally announced the points this year, gives Emma this role with while heart. They previously sealed his blessing with a joint Ding-a-Dong tattoo on their arms. Additional information: The Netherlands page. 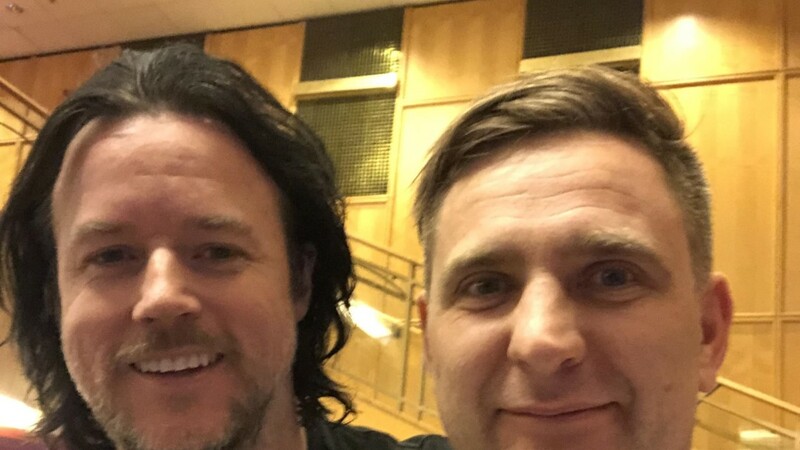 Speaking to Norwegian broadcaster NRK Eurovision Song Constest Executive Supervisor Jon Ola Sand mentioned that he has spoken to the Icelandic delegation from the broadcaster RUV and warned that it will have consequences if Hatari uses Eurovision participation with political goals. "We do not believe they will use the Eurovision Song Contest to protest. They know what rules we have for participation and that contest can not be used for political goals. But if they do, they will be knocked out of the contest". Sand also says that they have a good dialogue with the Israeli organizers, and that he does not believe Hatari will have trouble coming into the country. "We see no reason why they should not receive entry permits. We have a close dialogue with the governments of Israel, and they know that it can quickly turn back on the local organizers if anyone is denied a visa". The new voting system in Melodifestivalen made only one big difference: Lina Hedlund went to the final from the third semifinal instead of Rebecka Karlsson. With the old scoring system, John Lundvik would have qualified to the finals only from the 2nd place, loosing to Bishara. In the final, Lundvik received 12 points from 6 out of 8 groups of TV viewers. It has also been known before that place 6 and 7 would have switched between Oscar Enestad and Jan Malmsjö in their respective semifinal. In semifinal 4 Ann-Louise Hanson benefited from the new system, she would have been last with the old voting rules and finished 5th with the new scoring. Anton Hagman finished 6th, being 5th with old system and Pagan Fury would have been 6th and not last. With the old system, in the final viewers would have ranked Wiktoria as 6th instead of 8th, Lisa Ajax as seventh instead of 9th, Arvingarna as 8th instead of 6th and Anna Bergendahl as 9th instead of 7th. The number of votes in the Melodifestivalen hit the record and increased by almost 20 per cent from the previous year. The statistics from the app show that the number of people who chose to vote increased rather than the individual users voting more intensively than before. During the Melodifestivalen 2019 , viewers donated SEK 7,885,467 to Radiohjälpen charity. The amount has almost doubled since last year. During the final, the viewers donated almost SEK 4.3 million, which is the highest final listing in ten years. During the Melodifestivalen 2019, Radiohjälpen's telephone number has for the first time been presented as the first choice in the broadcasts. The amount collected during the finals and the Second Chance will be donated to fight humanitarian crisis in Yemen. You can read complete analysis of the results (in Swedish) here, and find the results itself here. In the press center of Sputnik-Moldova was hosted a press conference of the representative of Moldova, Anna Odobescu, with the participation of her husband Alexander Vdovichenko. "We went to participate this year with the only one goal - the victory. This song deserves to be heard by all of Europe. We can adequately present our performance in Europe," said Anna. "We are going with a fighting mood, we hope to get through to the final, we have a feeling that we can do it - we need to think positively and set ourselves up for good. We all know perfectly well that politics plays a huge role in this contest, and now everything depends on how much those countries with whom we are in the same semfinal are going to rate us". "We have a very good team of real professionals. There is still nothing decided about the show, but one country from the former Soviet Union wants to help us in this adventure, they offer a very interesting show, but it all depends on whether we find finances for it. Our team will also include guys from the Sunstroke Project, they will come with us as the supporters. Also our backing vocalists Mihaela Andrei, Andrei Ștefăneț, Andreea Portarescu, who are already well-known performers themselves, but they agreed to sing with us, and I hope that they will go with us to the end, "said Vdovichenko. 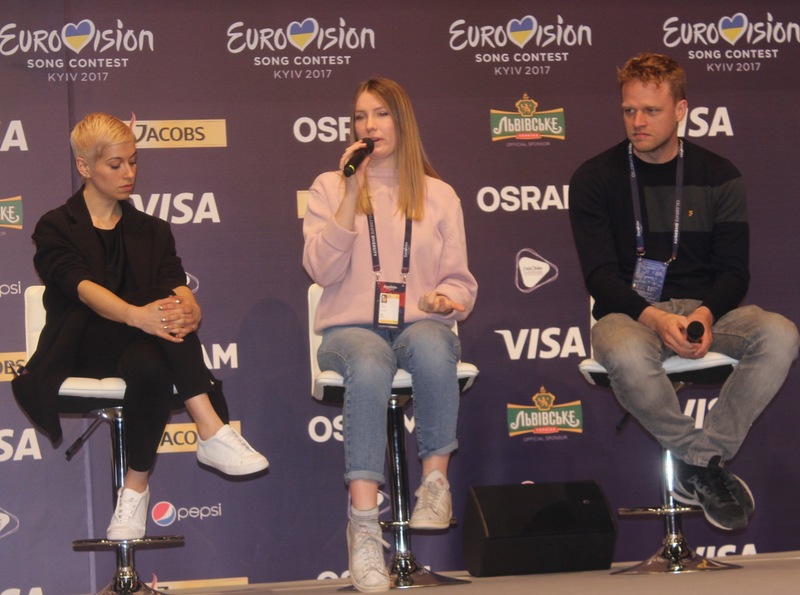 Of the participants she had already seen from the other countries, Odobscu noted the representative of France, Bilal Hassani, "I really liked it, I like this style of song and his vocal technique," The Netherlands Duncan Laurence, "a wonderful song and arrangement," Russia's Sergey Lazarev, "he also has a ballad, many said to us that the ballad is not a right song for the Eurovision, but I've noticed that there are a lot of ballads this year, and we have great chances, I think so. ". Canadian-Israeli billionaire Sylvan Adams said Tuesday that it is "looking very good" that Madonna will perform at the Eurovision this year. Adams, speaking at the Keshet INTV Conference at the YMCA in Jerusalem, said he had gotten involved with the upcoming Eurovision in Tel Aviv in the hopes of bringing a huge-name artist to the show. "We've reached out to Madonna to try to add a little bit of glitz to the event," said Adams to Channel 12 News reporter Ben Mittelman. "It's looking very good that she's going to come here and participate in the Eurovision Song Contest.". Last month, reports leaked out that Adams had approached KAN and offered to foot the bill for bringing Madonna to appear at the live grand finale in Tel Aviv on May 18. Ynet reported that Madonna had demanded more than a million dollars to appear at the show. KAN's budget for the 2019 Eurovision - funded partly by a loan - stands at NIS 120 million. In an interview to Omroep Brabant producer of "Arcade" Wouter Hardy told the story of the creation of the song which was shaped in his studio on Rotterdam Maashaven. Wouter Hardy (27) worked with Duncan Laurence for two years. The two were linked by music publishing company Sony ATV. 'This is an artist that I think I will fit in', was the message. Hardy got five demos. There was a very early version of Arcade. "I was especially triggered by his voice, and you can do a lot of things with that." Hardy went to work with Laurence. And Arcade was the number they were going to work on first. In the studio Wouter shows separate tracks from Arcade on a screen. It is 165 tracks. "I think this is really beautiful, these are the strings, the drums, the basses, the piano, the synthesizers, choir, Duncan's voice, of course, backing vocals, that's why there are so many tracks.". When the song was finished, he actually had no expectations, and certainly not that it will become Eurovision favourite. "I never expected that, that are crazy feelings, you just do not believe it, I wake up every morning and see all kinds of messages, people send e-mails and messages on Instagram, it's really crazy, we've been there for two years and that's it. That is how it is received: I am only very proud of that. " But Hardy still never makes any illusions. "It can go in any direction, that you are ranked number one among the bookmakers is fine of course, but it also gives a lot of pressure, especially for Duncan. A lot is expected of him. I think Duncan is one of the best live artists I know, he can hit people with his voice, I think people will be really impressed. ". Spanish entrant Miki has started rehearsals with Fokas Evagelinos, artistic director of the staging of "La venda" , and Mamen Márquez, musical director of the Spanish entry. Fokas Evagelinos has been working since Thursday in Madrid with Miki. The artistic director has indicated that we will see "fantasy, color, explosion" on stage through a story that will perfectly convey the message of "La venda" . Evagelinos has pointed out that the first time he heard the song he felt joy, optimism and he felt dragged by its rhythm . He also highlighted the qualities of the Spanish singer: "He is a fresh artist and has a lot of talent. And he performs the song with a lot of light. Belongs to a new generation of young people concerned about the times they live in". Miki himself has described the staging in three words , "big, party and organic", and about the first rehearsal with the Greek director has said: "The first contact with Fokas has been super good, because it is very detailed, but leaves margin to natural movements. It's all very easy and lets us be ourselves on stage". Miki will not be alone on stage. Next to him will perform singers and dancers Mikel Hennet, Ernesto Santos, Fran Guerrero, María Acosta and Mary Martínez. The Catalan will practice the next few weeks with Mamen Márquez, his vocal technique teacher at OT 2018 : "We are going to work on the vocals, the harmonies and, above all, the fact that it sounds big and broad and does not drown while you are on stage". "We will have weekly rehearsals, where he will perform the song singing and dancing at the same time, sometimes we make three and four consecutive passes without stopping so they can take that background that the theme requires". The team has rehearsed eight hours a day for five intense days but the directors are satisfied with the result since both Miki and the dance team and choirs are very disciplined. Mamen has acknowledged that working with Miki "is a gift" because he is 100% committed to what he does. "In rehearsals there are times when I ask him to rest and he always says that if his teammates work, he does too, he brings incredible energy and is a good partner," she said. Eurovision 2019 Euroclub will be located at Hangar 11 venue in the Port of Tel Aviv. Israel will perform 14th in the Grand Final of the 2019 Eurovision Song Contest. As the producers of the show determine the running order of the Grand Final, the running order position of the host country is traditionally drawn during the Heads of Delegation meeting. Evi Papamichael, Head of Delegation from Cyprus, who finished second last year behind Israel's Netta, had the honour of executing the draw under supervision of Jon Ola Sand. The outcome: Israel will perform 14th in the Grand Final. Arranger Darko Dimitrov was added to the composers of Serbian entry, Sebastian Lestapier to the Estonian, Rûdiger Schramm to the Norwegian. Eliot is now credited as co-writer of Belgian entry. Lyrics for Georgian entry have been penned by Diana Giorgadze. 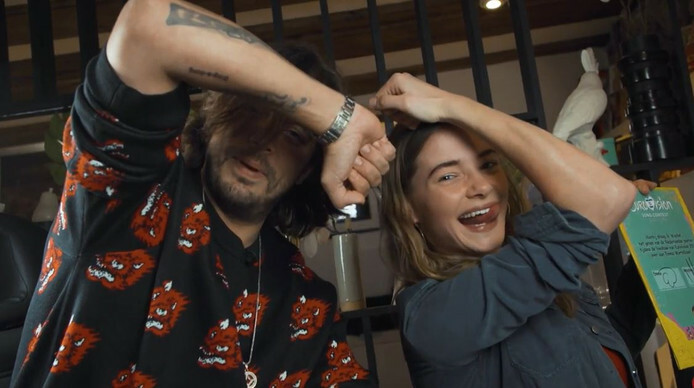 From the list of songwriters of French entry have disappeared Bilal Hassani himself and Medeline, it is now credited only on Madame Monsieur duo. Mary Susan Applegate disappeared from San Marino - now the songwriter is only Serhat. The positions of songwriters in Switzerland was clarified, the music is now credited to Jon Hällgren and Lukas Hällgren, while Laurell Barker, Mac Frazer, Luca Hänni, Jon Hällgren, Lukas Hällgren are credited to the lyrics. In Russian entry, the authors of the music are Philip Kirkorov, Dimitris Kontopoulos, the authors of the lyrics: Sharon Vaughn, Dimitris Kontopoulos. In Cyprus, Teddy Sky in the list of co-writers of the music is listed under a pseudonym, and in the co-writers of the lyrics - under his real name Geraldo Sandell. During the meeting of the Heads of Delegations, three positions in the Eurovision Song Contest Reference Group were up for election. The Reference Group is the EBU's executive body of the contest on behalf of all Participating Broadcasters. Italian representative Nicola Caligiore from RAI and Aleksander Radić from Slovenian broadcaster RTVSLO were re-elected, Swiss Head of Delegation Reto Peritz also got voted in. The Netherlands' Emilie Sickinghe from AVROTROS will leave the Reference Group after serving two terms. 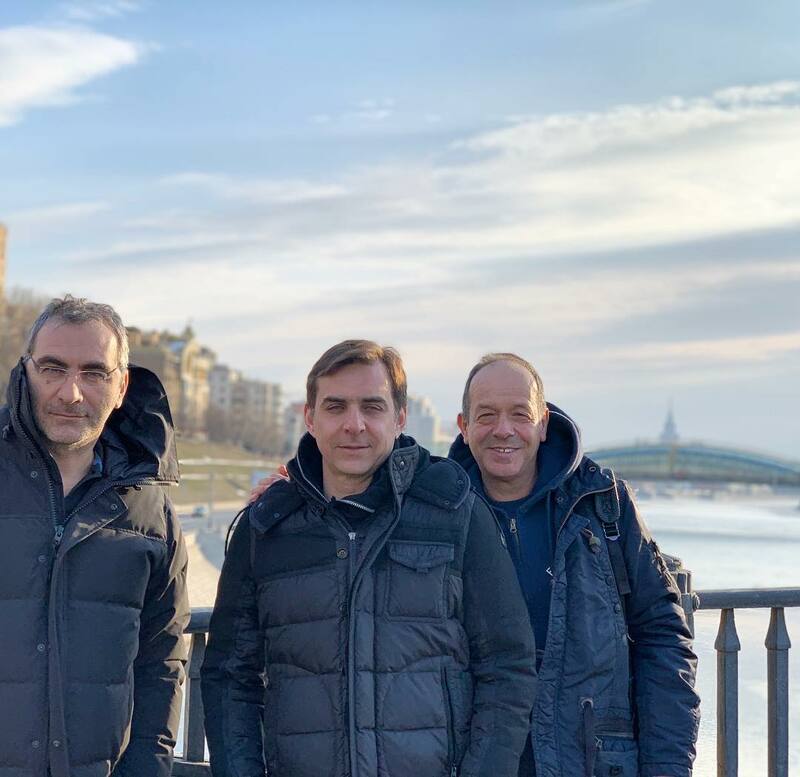 The newly composed Reference Group will get to work after the contest in Tel Aviv, when it will be joined by the Executive Producer of the 2020 contest. 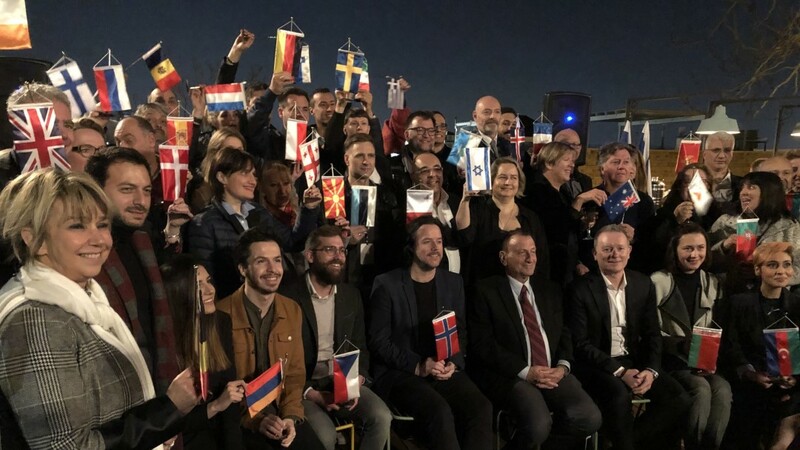 Yesterday, Heads of the Delegation competing in the Eurovision Song Contest 2019 have gathered in Tel Aviv for the special meeting. During the three days, professional conferences and guided tours will be held for them, including visit to the venue "Tel Aviv Expo". Meeting is also attended by senior EBU officials led by Jon Ola Sand, Executive Supervisor of the Eurovision Song Contest, Mayor Ron Huldai, senior executives of the broadcasting company KAN, Executive Producer of ESC 2019 Zivit Davidovitch, Lead Director of ESC 2019 Yuval Cohen and Tali Katz, the head of the Israeli delegation. 3. Original master recording of the track for the CD compilation as it is being performed at the ESC, i.e. the song in the CD must be strictly identical as the one to performed in the Show(s). - As soon as the song is selected. If the rights owner doesn't possess the necessary resources it shall offer the distribution of the recording to the EBU appointed Record Company. All material is delivered via uploading on the ESC intranet. - If the selected song (together with the backing-track) is not delivered as per the deadline. - If the language of the lyrics or the title of the selected song are modified after the HoD Meeting. - If the lyrics, biographies and pictures of the Contestant and other information for the official website of the ESC and the CD DVD Compilation albums are not delivered as per the deadline. - If any other material is not delivered by the deadline. You can find more details in our previous publication in regard to the Eurovision rules (as of 2016 edition). 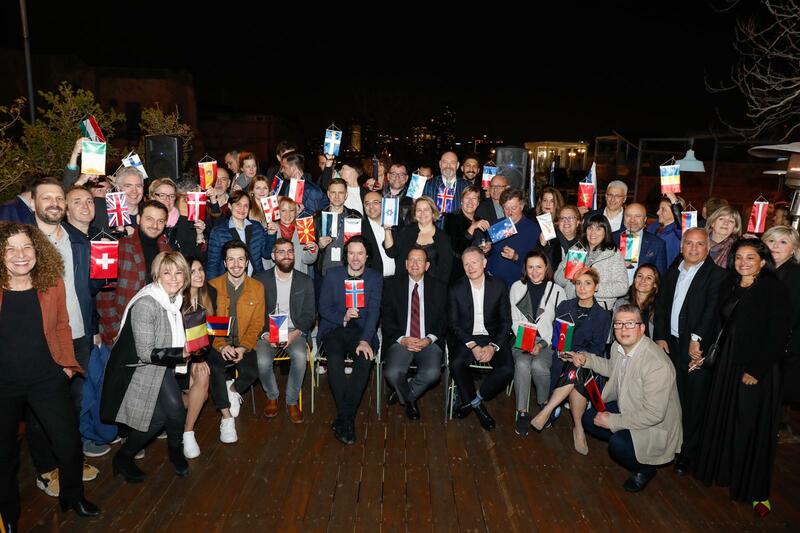 KAN and EBU have launched official ranking game for the Eurovision Song Contest 2019 called "Douze or Boos". Listeners will be able to hear 20 second extracts of each competing song without being identified with the name of performer or the countries they represent. The goal of the project is to focus on love to music without political influences. The songs are displayed in a Tinder-like interface, allowing each user to indicate whether he likes or dislikes the song, based on musical preference only. In addition, users will be able to create a list of favorite tracks from the songs participating in the contest and share their preferences in social networks. The game has been developed by Rabbi Interactive technology agency. Gil Rabbi, CEO of Rabbi Interactive, said: "We have designed the product in the spirit of the Eurovision Song Contest for love of music, with the intention of moving away from foreign influences such as politics, which will enable competition fans to connect to their favorite songs without prejudice opinions"
Recall that unofficial favourites sorter by Mr. Gerbear can be found here. 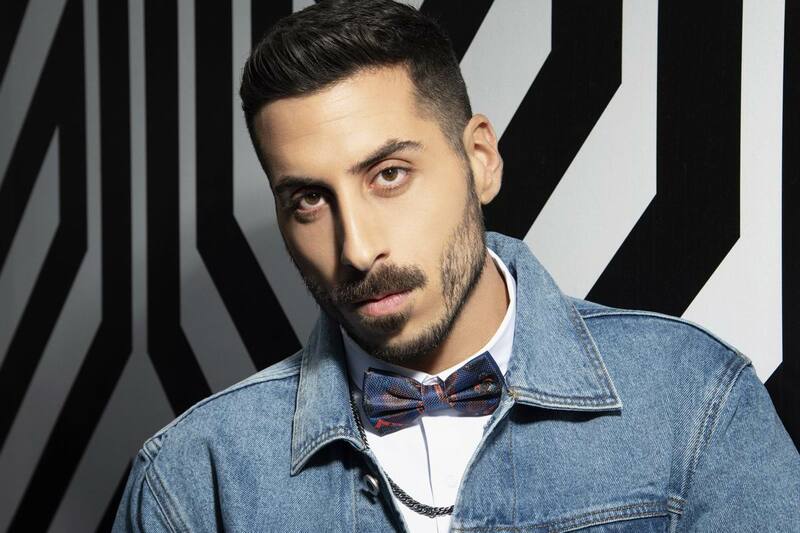 The Israeli entry to the Eurovision Song Contest will be performed by 27-year-old Kobi Marimi who brings unique vocal capabilities and a magnetic personality. With 'Home' as the chosen song, Kobi would definitely deliver sleek elegance and a powerful performance to the Eurovision Stage. 'Home' was co-written by Inbar Wizman and Ohad Shragai both singers and songwriters from Tel Aviv. 'Home' is a "Soulful Ballad" which fuses Gospel and Contemporary Soul with Middle Eastern influences. The lyrics of the song focus on Kobi's own life journey; The long and difficult search for his own self-esteem. When he finds peace with he's true self and embraces the person he became, the realization that his heart yearns for HOME arrives. The video was directed by one of Israel's leading directors, Guy Sagy who also directed 'Diva' by Dana International,1998 Eurovision winner. The video clip was filmed in black and white, using classic shooting techniques that brings Kobi to the center and gives respect to his unique vocals This year's entry, for the second time, is a co-production of 'Tedy Productions', one of the most prominent and influential content and production houses in the Israeli media, 'Kan', the Israeli Public Broadcasting Corporation and Israel's biggest media company with 3 broadcasting platforms and 'Keshet12', the country's leading commercial broadcast television channel. "Walking out" was composed by two Armenian music artists "Lost Capital" and "tokionine". The lyrics were written by Garik Papoyan, who has also written Aram MP3's "Not Alone". "When I first heard the melody, visions flashed before my eyes. Events that haven't yet become memories… I realized that this fight and the collapse of the emotions inside me have to be reflected in my song. I want to tell myself and everybody else: "Don't kill love, but don't let it kill you" - said Srbuk. The song represents a conflict of emotions, a monologue that can quickly turn into a dialogue. Questions with no answers, a fight within yourself, a power and determination to move on. The music video was produced by "Factory Production" . It was directed by Arthur Manukyan, DOP - Artyom Abovyan, stylist - Ani Mesropyan, choreography - Hovhannes Sargsyan. "We wanted to visually portray the emotions within a loving but betrayed heart. When you think you will be filled with joy, but instead there is not enough air to breathe. When you want to share your happiness, but instead you start loosing yourself: your hands are tied, your emotions are overwhelming, you keep pretending just to keep your love alive. But what are you waiting for? How long can you play by these rules? These are the questions and emotions visualized in the music video" - said Srbuk. The music video has a lot of symbols and messages, clues that each person will interpret individually, as these feelings are universal, but the outcome is always a unique story. PBS has launched the song that will represent Malta in the upcoming Eurovision Song Contest in Tel Aviv. Michela Pace, with her distinct and memorable voice, will be singing 'Chameleon'. 'Chameleon' is an upbeat good feel song with a fresh current pop sound with a Reggaetone grove as well as Cuban undertones. The song has been written and produced by Symphonics who have already had a 2nd, 3rd and 4th place in Eurovision in the last 3 years. It is second entry of Bulgarian songwriter Borislav Milanov, who is also behind song of Azerbaijan. 'Chameleon' was recorded in Vienna, Sweden and Malta , whilst the music video was shot all in Malta and produced by PBS. 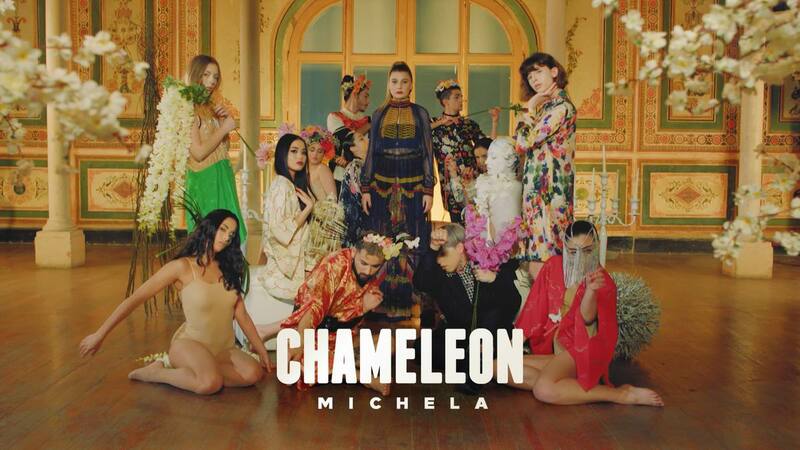 After dedicating the last days to finalize the chosen song and shoot the music video, in the coming weeks Michela will continue with her preparations to take the Eurovision stage on 16th May 2019. Shurat HaDin, Israel Law Center (ILC) - civil rights non-governmental organization focused on representing terror victims has applied to the Interior Minister asking to prevent allowance of Hatari band members to the Israel, reports Yedioth Ahronoth. Organization founder Nitsana Darshan-Leitner says: "We have received information that the band representing Iceland supports the boycott of Israel. Last summer, the band signed a petition distributed in Iceland calling for the boycott of the Eurovision Song Contest. After being selected, the Hatari group announced that it intended to protest against Israel on the stage of the Eurovision Song Contest, despite the fact that it contradicts the rules of competition. According to the amendment to the Entry into Israel Law, a visa and residency permit in Israel will not be granted to a person who is not an Israeli citizen or has a permanent residence permit in Israel, if he or the organization or body he is working for has knowingly issued a public call to boycott Israel as defined in the Prevention of Harm to the State of Israel Law. The Icelandic band publicly and explicitly called for a boycott of Israel and supported it. They must be prohibited from entering the country". Scandalous Former member of Knesset Oren Hazan also stated that the band should not be allowed to the country. "The Eurovision Song Contest was not intended to serve as a platform for anti-Semites who delegitimize the state! It is forbidden to allow the government to fall asleep on guard duty - it is its duty to prevent them from entering the country. For my part, they will stay at Ben-Gurion Airport and will sing to the wall", he wrote. Interior Minister Aryeh Deri responded that the case will be examined together with the Ministry of Strategic Affairs. 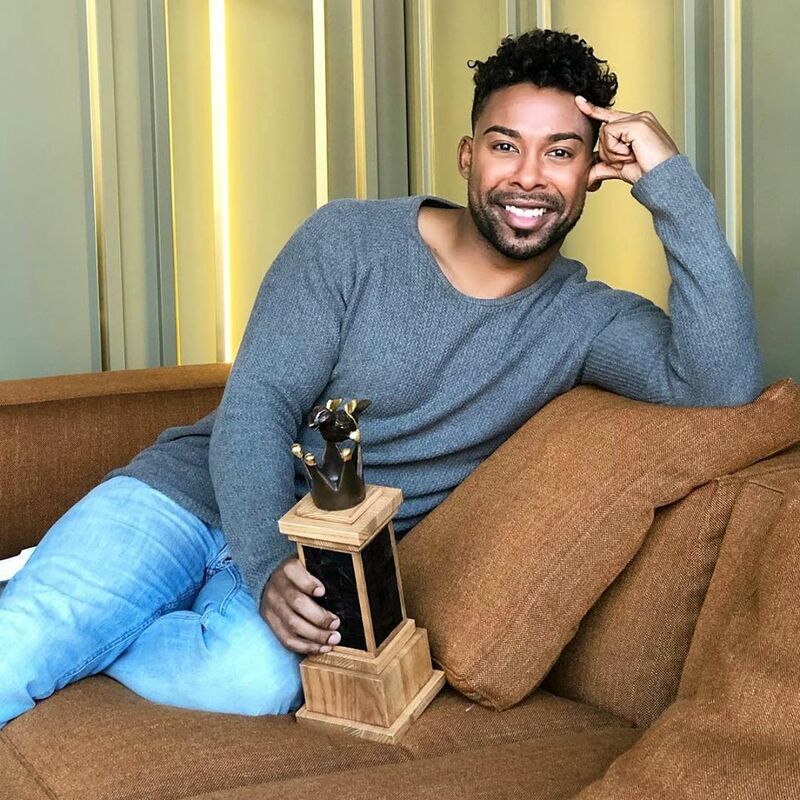 John Lundvik will represent Sweden at the Eurovision 2019 with the song Too Late For Love. This year, Lundvik is also co-writer of the British entry. This is last artist chosen for the competition this year. Russian Eurovision entry "Scream" has been presented. It was composed and produced by Philipp Kirkorov and Dimitris Kontopoulos on lyrics of Sharon Vaughn (Ireland 2012). "Finally here's the song "Scream" with which I will represent our country this year at the Eurovision Song Contest 2019 in Israel. When I heard this song for the first time, I felt an incredible strength and power of the melody. Then the lyrics appeared and everything got even the bigger meaning, and director Konstantin Cherepkov made a unique and touching video. I am happy to take part in the Eurovision again, this time showing myself from a different musical side. I want to thank you in advance for likes and even dislikes, reposts and comments for downloading and listening to the song. Because all we did with the whole team - it was for you !!! Thank you all. ❤ ", wrote the singer. The director of his music video, Konstantin Cherepkov, says: "The strong melody, the dramatic lyrics of the song and Sergey's powerful vocals inspired me to create this unique dark music video - the story of the hero's spiritual maturity, the struggle with our fears, which we all carry from childhood, and which as we grow, turn into "screams". It is in the struggle with oneself that one can know one's own strengths and capabilities. Our Artist - Sergey Lazarev - essentially goes the same way in his life, overcoming obstacles and overcoming fears. The young boy, symbolises our hero Sergey, while the island symbolises the end point of a journey we should all take in order to overcome our fears. We decided to move away from any computer special effects and "synthetic" chewing gum, which screens are now full of, and tell about the feelings with "warm" analogue techniques. We have combined technology stopmotion animation, 2D projections and scenery, getting a fabulously realistic world, shot live." Check the photogallery from SVT Melodifestivalen Jury Final show. "I'm a maximalist and very critical of myself. During my A DAL performances, we continually made changes, but even after the final I felt that something was missing, so I went to the studio few days ago. I wanted to make sure that I had no shortcomings with the song. So my conscience is clear that I was able to polish something. I could not sleep until we finished, but now I feel the strength there was not before", singer said at "Talpra magyar!" program on Petőfi Rádió. "Even before the 2017 contest, I talked to people who had already been in the Eurovision, they all told me, try to enjoy the events. Well, you can't do that there. When I stood on that monumental stage, I felt dizzy for a moment and realized why I had to go to the stage two weeks before. Now, however, I'm trying to look at myself a little bit from above and enjoy it, to live the moment the way I need it, "said Joci. "Of course I want to get the best position, I have the competitive spirit", he adds. "The main message of the song is that in this fast-paced world we have to slow down and we need to pay close attention to our loved ones and to show our love in the present, because if we lose them, it can make a very big wound," the singer told. These days also the technical video of the stage presentation has been filmed to be submitted to the EBU and directors of the event to work on stage performance in advance. In general, the stage presentation will be similar to what was already seen at A DAL 2019, on the other hand, Tel Aviv offers much larger stage and there are a lot of technical solutions available, so things need to be adapted. On Sunday Joci will travel to Tel Aviv to film his Eurovision postcard. Last weekend, Lithuanian representative Jurijus went to Switzerland, where he met the songwriters of the song Run With The Lions. "I went to Switzerland on Sunday evening, one of the songwriters, Pele Loriano, who lives in Switzerland, met me. And the other songwriter, Eric Lumiere, came specifically from Los Angeles. They don't waste time - if you're already working, it's a full leg. This time, only Ashley Hicklin, who lives in Edinburgh, was unable to be present, but with him I have recorded the first version of the song". The artist says it is hard work to record a song. "Everything had to be rewritten - every vocal line had a lot of different fixes. We recorded maybe 9 hours, and 4 more - we sat up and managed the vocals. I had to sit down on the couch in the studio, too, "says a Lithuanian representative. Although the song "Run With The Lions" was recorded by highly experienced professionals, Jurijus was surprised by their simplicity and concern. "I really liked them being ordinary people, though looking at how much they do, and how much this year they will have songs in Eurovision, they should act as world-famous stars. In addition to me, they have been involved in German, British and Swiss entries. They are top-level professionals - there was a long breakh before each record, we discussed every word of the song - what it means to impart emotion. It is important for them how the performer feels. It's no secret that everything costs, nothing is free, but money is a third or fourth thing. It is more important for them how you feel as you sing, what can be improved, "the singer adds. The song will sound completely anew. "You can really expect a new sound. We made a new middle part of the song, and it will be much more powerful. People commenting often said the song has no development, so we together with songwriters thought what can we do". He says he decided to renew the song not only because of external pressure - the idea of ​​change was born together with the songwriters in Switzerland. Jurijus says he still has a lot of hard work to do, but he will definitely improve his vocal to achieve the best result. "I'm training at home, but before going to Israel, I'll still work with the vocal teacher Victoria Kalpokaite. She is a true vocal specialist who helped me not only vocally, but also emotionally, because it has a great influence on singing and performing because you sing in the body, not in the voice. We'll all need to work - both me, and my wonderful five backing vocalists, "he assures. Jurijus will attend promotional events in London, Amsterdam and Madrid. He says he is not interested in partying, but for him concerts are more important. Jurijus is going to present himself abroad in a slightly shorter name because he noticed that foreigners find it difficult to pronounce his name. "I'll introduce myself differently, shortening the name. I have heard my name pronounced as "jury juice", so I'll teach everyone to shorten it, "the Lithuanian representative laughs. "Walking out", the Armenian Eurovision 2019 entry, will premiere on March 10, at 18:45 CET / 21:45 Armenian time. Contest entry of North Macedonia - Tamara Todevska - Proud has been released. Malta will release its Eurovision song in 48 hours. The song has been selected from over 300 songs submitted. After recording a number of demos, multiple focus groups and industry experts voted to get to the final song. 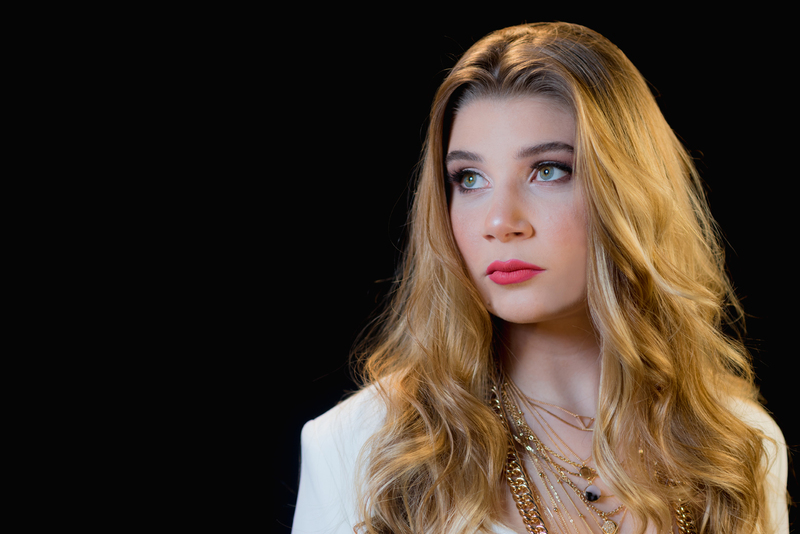 Michela will be portraying another side of her versatile capabilities through this song. Michela is the winner of the first edition of XFactor Malta, which took her through a challenging journey to make it to the final stage. A competition that attracted over 500 applicants, and managed to gather a record live audience for Malta of over 200,000 with an unprecedented 132,000 votes submitted which determined the winner. This is the first time that an X Factor winner will represent Malta at the Eurovision Song Contest. Asked for his reaction, X Factor mentor Howard Keith said that as Michela has shown us throughout the competition, she does not shy away from challenges. Predictability is not part of her vocabulary and this song shows another side to Michela … get ready for the change. X Factor Malta judge Ira Losco said "When I saw Michela sing this song for the first time, I was simply amazed at how much she is prepared to change and show us yet another side to her. Michela is an 360 degree artist. I simply love this song and her memorable voice". Renowned local music producer Elton Zarb who was part of the focus groups to help PBS select the song described the song as "A breath of fresh air – a brilliant song". The song will be released on Sunday at 18:00 CET. Eurovison entry of Polish band Tulia has been presented. Pali Się (Fire Of Love) is the third original song that appeared on Tulia's platinum debut album. It is one of the most powerful and energetic tracks on the record. Some may hear rock vibes inspired by the work of Led Zeppelin or sounds known from The White Stripes albums. With this track Tulia, once again proves, that they are not afraid to experiment, mixing heavy rock vibe with folk elements. The music video was inspired by Oscar - nominated movie „Cold War" directed by Paweł Pawlikowski. Chingiz Mustafayev to represent Azerbaijan at Eurovision 2019. The 27-year-old singer-songwriter will take the Eurovision stage in Tel Aviv with the song 'Truth'. 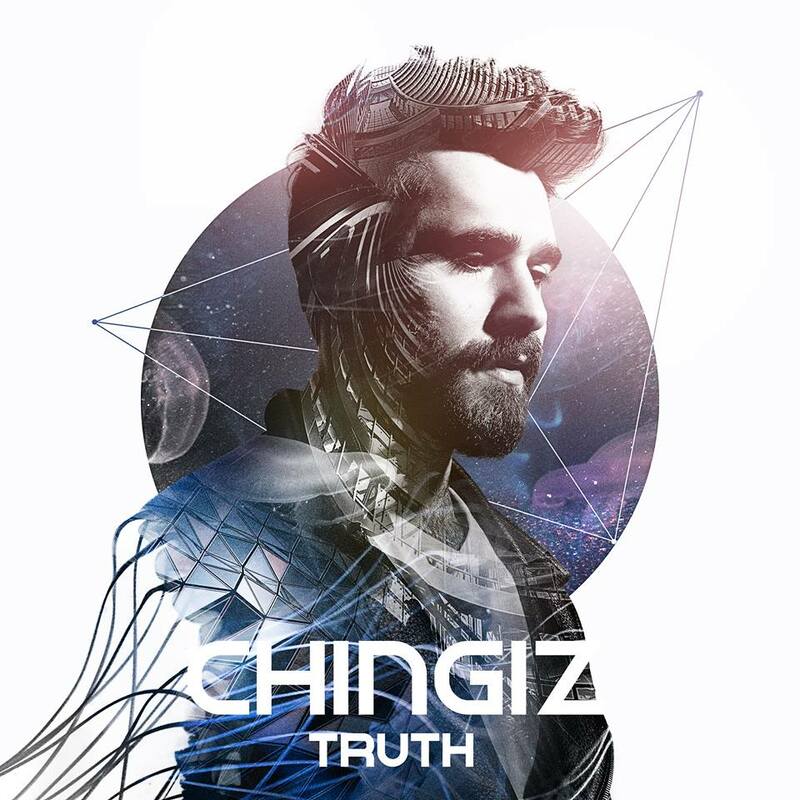 Chingiz is changing up his artistic approach for the 2019 Eurovision Song Contest. 'Truth' is contemporary, radio-friendly and personal. His performance in Tel Aviv will be a major departure from his flamenco-inspired compositions and beloved guitar. "Initially, I was a little nervous about how Chingiz would perform the song, since he comes from a different musical background. But meeting him totally changed my mind. He's so passionate about music and his own culture. We even added some unique elements of traditional Azerbaijani music, which worked brilliantly to make the song an authentic fusion of Azerbaijan and the West," says Bulgarian-Austrian songwriter Borislav Milanov. His song won the national song selection organized by Azerbaijani Broadcaster Ictimai TV in January. The contest received more than 350 entries. 'Truth' is about a dishonest, toxic relationship. The song explores the story of one partner who betrays the other, leaving them with a difficult choice: accept deceit or break free from false illusions. Music video for Czech entry by Lake Malawi - Friend of a Friend has been presented. Additional information: Czech Republic page. Russian entry to be presented at 17:00 CET tomorrow, on 9 March, as was revealed by Sergey Lazarev in his Instagram post.
" The time has come: Saturday 9 March at 17.00 CET we will release the Eurovision entry for Russia. I really hope you will all LOVE the song as much as I did from the first time I listened to it. This is a new journey for me and I am so excited for it. Thank you, Philipp Kirkorov, not only for your contribution to the song, but most of all for being always there for me like a brother. True friendship exists in show business and you are the best example of this. Thank you, Dimitris Kontopoulos, for this powerful melody, the great production and all of the hours of work you have spent for this song. Sharon Vaughn, your words gave meaning to the melody. It's an honor working with you and singing your lyrics. Moscow Symphony Orchestra, your contribution gave a different meaning to the song. I am so glad that we managed to bring live orchestra back to Eurovision, even in this way. Andrey Konoplyov, you are the best sound engineer I have ever worked with. Alex Panayi, thank you for your patience, you are a true professional. Finally the biggest thanks goes to everyone in channel "Russia" for trusting me, for the second time, to represent our country. I promise you all to do my best in order to honor your decision. 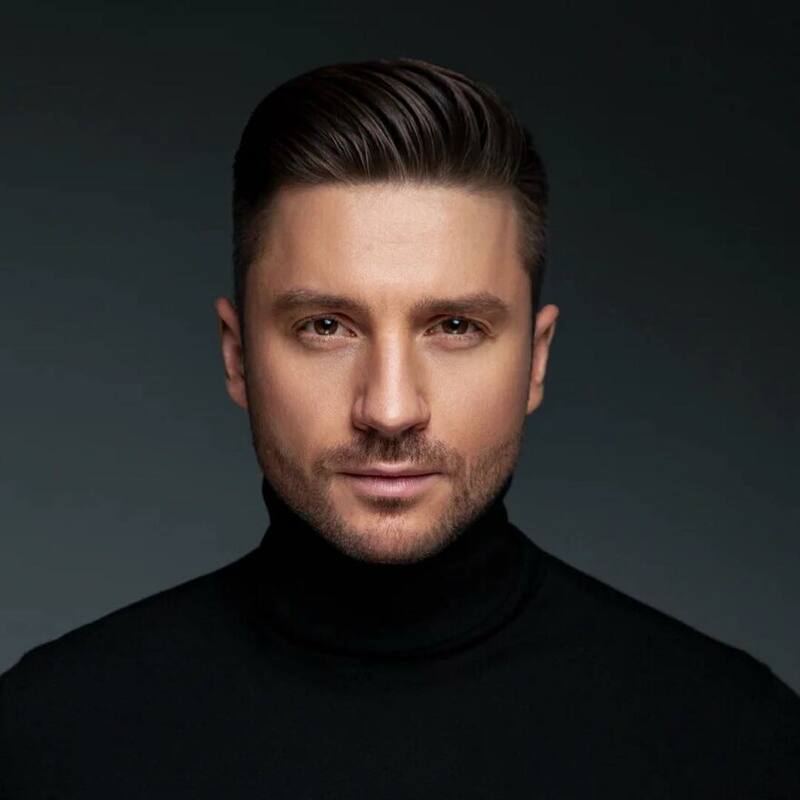 "Tears aren't quiet things..." #sergeylazarev #сергейлазарев #eurovision2019 #Russia"
RTÉ has revealed the act and song that will represent Ireland at the Eurovision Song Contest 2019. Sarah McTernan, who came third in The Voice of Ireland in 2015, will represent Ireland in this year's competition with a catchy song called 22. The track was written by Janieck, Marcia Sondeijker and Roulsen. McTernan is best known for coming third in the TV series The Voice of Ireland in 2015. Since then she has worked as a make-up artist in Limerick, given birth to a daughter, Mia, two and a half years ago, and formed a wedding band, The Jeds. She unsuccessfully competed to represent San Marino in last year's Eurovision. She and two Swedish songwriters Ylva and Linda Persson submitted one of the 430 entries to represent Ireland in this year's competition. The producers liked her voice, but not her song, and they liked the song 22 but not the singer. When they discovered McTernan was Irish, they decided to pair her with the song. "After I got the call, I was dancing around the place. I was so excited. As a singer, of course you want to represent your country," McTernan said. 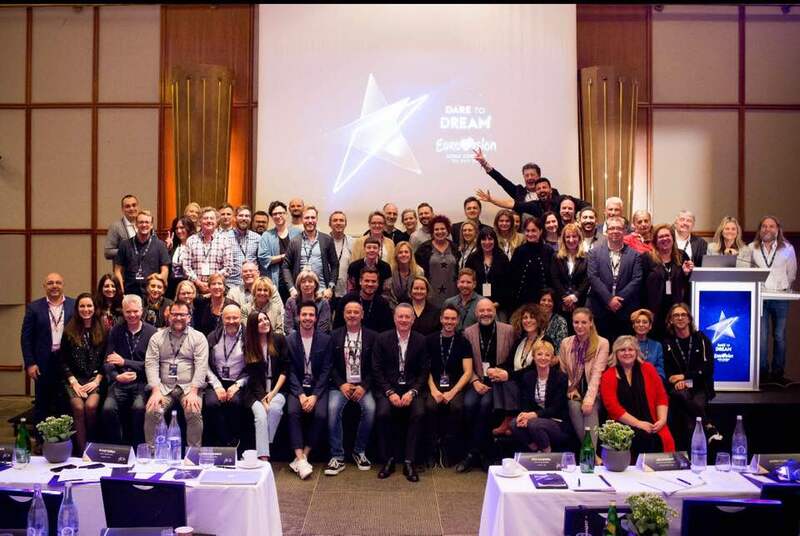 In August of 2018, RTÉ held its second annual Eurovision Song Contest Forum and invited key industry professionals, songwriters and performers to come to RTÉ to gain a deeper insight into the present day Contest from international Eurovision experts and key RTÉ decision makers. Over 430 songs were submitted to RTÉ for consideration before the November deadline. Several panels comprising music experts, journalists, Eurovision fans and students from BIMM shortlisted the entries received and ultimately the song 22 was selected as Ireland's entry. RTÉ's Eurovision producer Michael Kealy said there was "no question she has got star quality" and a "very distinctive voice". "We received a huge amount of entries for this year thanks in part to Ryan O'Shaughnessy's great performance in Lisbon last year. When you listen to 430 voices, trust me, you know a memorable voice. We asked her to audition to sing the song. We were blown away a bit. Sarah has an amazing voice which stood out the minute I heard it and she fits perfectly with our chosen song '22'. I think the Eurovision audience will love her, now it's full steam ahead preparing for her performance in Tel Aviv in May," he said. "Outside the wedding circuit in Ennis and Clare where she lives, most people wouldn't be familiar with her. We brought her in for camera tests. She is a very confident performer.". The 24-year-old singer from Scariff, Co Clare said being selected to represent Ireland in the much-loved competition is "like an early birthday present". "My 25th birthday is next Monday and if you'd told me last year that I'd be chosen to represent my country at Eurovision, performing the song for the first time on Dancing with the Stars this Sunday, and then flying to Tel Aviv on my birthday to record a postcard, I would have told you - you were crazy!". Sarah said her family, including her little girl, Mia, are "super excited" for the journey she is embarking on. "My Mom, Nana, family and friends are super excited for me - they're shocked and very proud. I can't wait to teach my biggest fan - my two-and-a-half-year-old daughter Mia - all the lyrics to 22!". Speaking about hearing the song for the first time, she said: "When I heard it at first, I just thought it was so catchy. It's a proper earworm. I thought it was really poppy and really current. It's a really strong song for Eurovision.". Filmed on Dollymount Strand, the video for 22 was directed by Christian Tierney who has worked with artists including Hozier, Niall Horan, The Weeknd, Macklemore, Demi Lovato, Kendrick Lamar, Drake, The 1975 and James Bay. Christian also directed the acclaimed music video for Ryan O'Shaughnessy's 2018 Eurovision Song Contest entry Together which went on to reach the Grand Final. Despite the cold temperatures on the day of the shoot, Sarah said it was still "great craic" and joked that she hopes no one notices her busting out her "dad moves". "I was just frozen. I wasn't really able to move so I was doing a bit of dad-dancing, so hopefully it's not too obvious," she laughed. Sarah will perform 22 for the first time on Dancing with the Stars on RTÉ One on Sunday March 10 as part of a special Eurovision Song Contest-themed programme, which will also feature a performance from Eurovision legend Johnny Logan. Austrian entry, electropop ballad Limits performed by Pænda has been just presented on Ö3-Wecker radio program. "Limits" is not a pleasant pop song. You have to get involved with the song. It comes calmly, but intensively, is very modern in appearance, almost avant-garde, and captivates above all by the beautiful singing of Pænda, which effortlessly raises to the highest heights and elegantly floats over very reduced beats. In any case, Austria presents itself at the ESC in a very forward-looking, and very modern. ORF believes that reaching the final should be quite feasible with this song. Especially in the rating of the expert jury, which is indeed characterized by their exquisite taste in music, Pænda should score big - the audience, however, could turn out the one or the other amazement at home on the couch, the points may be rather meager. It would be to wish of the 31-year-old musician that the director of the world's biggest music show placed her appearance in the 2nd Semifinal between two acts that go with shrill, loud, typical Eurovision entry. Pænda is ready for her big performance in Israel. The stage at the Convention Center in Tel Aviv will probably be taken by herself, musically supported by backing vocalists, who do not necessarily have to be seen in the spotlight. The exact staging will be intensively worked on over the next few weeks. She is not nervous. Rather positively excited, motivated to the blue colored hair tips, and full of anticipation of the adventure of her lives. With the song composed by herself she now has the great opportunity to make a name for herself as a musician all over Europe. Pænda is a one-woman show. She writes and composes her own songs, she plays all the instruments herself, and she also produces her own songs. And very clever: On April 26, she releases her new album "Evolution II", on which "Limits" is on it, and thus uses - quite legitimately - the Eurovision as a promotion platform. If the plan works, only the sky is her limit. Хореограф Лео Муйич, создатель балета "Gospoda Glembajevi", будет работать над хореографией Евровидения для хорватского участника Роко, сообщает Jutarni List. В настоящее время Муйич является хореографом рок-оперы "Иисус Христос - Суперзвезда", премьера которой состоится 23 марта, а Жак Хоудек сыграет в ней роль царя Ирода. После этого сотрудничества наставник Роко пригласил классического балетного хореографа усилить движения молодого исполнителя на сцене. "Евровидение - это шоу, которое я не смотрю уже много лет, но в детстве я следил за ним, в то время, когда оно было обязательным для просмотра, окном в мир", - признается Муйич. Он объясняет, что они не будут добавлять балетный танец в номер: "Я только улучшаю движения Роко, сценическую привычку, сдерживание, реакцию на определенную часть лирики. В исполнении будут некоторые сюрпризы, о которых я не буду говорить пока". Муйич характеризует Роко как интуитивного и интеллигентного ученика, талантливого как в вокальном, так и в сценическом плане. "В моей работе жанры разные, но качество является универсальной и вездесущей целью, будь-то балет, опера или Евровидение. Я очень хочу, чтобы наша страна была достойно представлена на Евровидении". "Я и моя команда Евровидения с нетерпением ждали 1 млн просмотров на Youtube. И наша радость была неописуемой, когда менее чем за неделю мы увидели, как песню "Walking Out" полюбили и распространяли по всем континентам. Но удивительно, что после достижения 1 млн просмотров, видео достигло 2.5 млн за один час и это число продолжает быстро расти. Мы уже связались с официальным Youtube каналом Конкурса Песни Евровидение, чтобы выяснить, есть ли какие-либо проблемы за быстро растущим индикатором. Мы сообщим вам, если у нас появятся новости". Напомним, что в 2013 году подобные подозрения были предъявлены в адрес представительницы Беларуси Алены Ланской, чей видеоклип собрал на Youtube миллион просмотров за сутки, и очень небольшие показатели до и после этого. Никаких действий по этому поводу предпринято не было. В Москве продолжаются репетиции номера Сергея Лазарева и его шведской бэк-команды. В интервью Yedioth Ahronoth Коби Мерими отреагировал на противоречивые отзывы о своей конкурсной песне "Home". "Возможно, несколько лет назад я не мог справиться с такими резкими реакциями, - говорит Мерими, - но я пришел на программу в возрасте 27 лет и очень много работал, чтобы справляться с критикой. Я не хочу что-то доказывать кому-то, кто пишет против меня, я предпочитаю сосредоточиться на музыке и на том, что произойдет на сцене"
"В начале Нетта Барзилай также получала резкие реакции по поводу Toy, и мы все знаем, что произошло в конце", - говорит он, добавляя, что и коэффициенты букмекеров также сильно изменятся после того, как станут известны сценические номера. Однако он доволен теми реакциями, которые положительно оценили песню. "Я был поражен тем, как было воспринято важное послание песни, посыл о расширении прав и возможностей", - сказал Мерими. "Любой, кто немного знает меня и следил за моей историей в "Следующей звезде", может понять, насколько важна для меня эта песня: каждый человек, который испытал что-то в жизни, которому говорили, что он недостаточно хорош, или который думал, что ему нет места в этом мире сможет соединиться с этой песней", - говорит Мерими. Всего месяц назад Мерими была выбран в качестве представителя Израиля, после победы в финале шоу "Следующая звезда". "Я почти не спал пять дней, только тут и там по часу или два", - говорит Мерими. "Но я не жалуюсь ни секунды, это было забавно, я мечтал об этом. Представлять мою замечательную страну - большая честь". В отличие от многих участников, Мерими говорит, что он не представлял свою победу в финале и даже не отпраздновал ее до сегодняшнего дня. "Я не знаю, как можно смириться с такими вещами. Это похоже на то, что кого-то еще зовут Коби Мерими, и это он выиграл шоу. Я много лет хотел пойти на такую ​​программу". Несмотря на то, что он дошел до финала, Мерими рассказывает, что он хотел, чтобы в шоу победила группа Shalva. "Я не думал о победе в финале, я сам проголосовал бы за группу Shalva, мне было больно, когда они отказались от участия ... Многие люди говорят мне: "Мы знали, что ты победишь". Я получил много комплиментов на улице, но я никогда не знал, как это сравнивать себя с другими участниками, я знал только что мне нужно было выходить на сцену, петь и отдавать все свои силы"
Саша Жан-Баптист станет постановщиком номера представителя Швейцарии на Евровидении 2019 Луки Хенни. Также в команду Швейцарии войдет хореограф Индиа Ришко. В интервью Независен весник представительница Северной Македонии Тамара раскрыла подробности своей подготовки к конкурсу. "Это действительно большая честь. С более чем 150 миллионами зрителей по всему миру Евровидение является самым популярным телевизионным шоу в мире, и у нас есть шанс показать все, что мы знаем и что мы можем", - объясняет она. "Самым важным шагом для нас было найти хорошую песню. Мы получили сотни отличных композиций от авторов песен из нашей страны и из-за рубежа, но после первого прослушивания Proud я сразу поняла, что это именно та песня, которую я хочу спеть в Израиле. Proud - это больше, чем песня. Это призыв всех людей верить в себя и не отказываться от своих собственных мечтаний. С помощью этой песни мы хотим вдохновить людей гордиться собой и жить своей жизнью, жить по своим собственным правилам. Вот почему мы решили, что ее посыл достигнет большего количества людей, если мы споем песню на английском, и я думаю, что мы приняли правильное решение", - говорит Тамара. На сцене к певице присоединятся три бэк-вокалиста Александра Янева, Антония Гиговска и Васил Гарванлиев. Александар Ношпал позаботится о стиле, а шведская команда будет работать над постановкой номера. "Я рада, что у меня есть отличная команда. Благодаря им и их самоотверженности, в этом году моя главная задача - спеть песню как можно лучше, и, конечно, я это сделаю". "Всю свою жизнь меня окружали успешные женщины. Я горжусь своей матерью, которая всегда была рядом со мной и верила в меня, даже когда я сама не верила в себя. Я горжусь своей сестрой и моими друзьями, потому что они учат меня становиться лучше каждый день. Я горжусь всеми женщинами, которые живут по своим правилам. Наступает наше время. У меня также есть замечательный муж и двое замечательных детей, которые являются центром моей жизни. У меня есть семья, которая всегда рядом со мной, и поклонники, которым я чрезвычайно благодарен за ежедневную реализацию моих мечтаний". Шведские исполнители Адам Свенссон, Йенни Йанс, Эрик Сегерстедт и Симон Лингмерт приступили к репетициям номера Сергея Лазарева для конкурса Евровидение 2019. Адам и Йенни уже выступали с Сергеем на Евровидении 2016. Постановкой номера руководит греческий режиссер Фокас Евагелинос, который в этом году также работает над номером Испании. Репетиции проходят в Москве, где собрались все члены Dream Team. Адам Свенссон более известен поклонникам Мелодифестивалена и Евровидения как штатный танцор. В 2016 году он выступал на Мелодифестивалене в качестве бэк-вокалиста Samir & Viktor в их заявке "Bada Nakna". В настоящее время является солистом шведского дансбанда Highlights. Йенни Йанс - бэк-вокалистка с самым большим опытом выступления на Евровидении, которая в 2012, 2013, 2014 и 2017 году была задействована в номерах представителей Азербайджана. Как упоминалось выше, на Евровидении 2016 она уже выступала в Глобене в составе команды Сергея Лазарева. На Мелодифестивалене 2017 Йенни пела бэк-вокал Уве Тёрнквисту. Эрик Сегерстедт известен поклонникам шведской музыки как один из солистов EMD. Группа участвовала в шведском Мелодифестивалене 2009 с песней "Baby goodbye", заняв третье место в финале. В 2013 году он вернулся на конкурс в дуэте с норвежкой Тоне Дамли с песней "Hello Goodbye". одним из авторов которой был будущий победитель Евровидения 2015 Монс Сельмерлёв, и дошел до Второго шанса. На Мелодифестивалене 2017 Эрик выступил на бэк-вокале у Робина Бенгтссона, Антона Хогмана и FO&O, а спустя два месяца после финала в составе шведской делегации отправился на Евровидение 2017, где пел бэк-вокал Робину за сценой. Симон Лингмерт является выпускником шведского Идола 2010. В 2014 и в 2015 году являлся штатным бэк-вокалистом Мелодифестивалена. Трекер выхода превью видеоклипов: 08/03: Австрия, Ireland, Чехия, Азербайджан, Македония, 09/03: Россия, Черногория, 10/03: Румыния, Мальта, Армения, Израиль, Албания, 11/03: Молдова. Трекер выхода синглов: 08/03: Великобритания, Македония (караоке), 09/03: Россия, 10/03 Румыния, 14/03: Словения, Албания. Представители Латвии, группа Carousel, работают над их альбомом и готовятся к поездке в Тель-Авив. Посмотрите, как прошла официальная фотосессия коллектива. Представитель Швейцарии Лука Хенни совершил поездку в Тель-Авив, чтобы записать свою открытку для конкурса Евровидение. Певец дал интервью каналу Reshet 13 на знаменитом песчаном пляже длиной 14 км. Лука говорит, что город уже находится в лихорадке Евровидения: "Жители полны ожидания и очень гордятся тем, что будут принимать конкурс". Здесь светит солнце и температура 20 градусов: "Я не очень скучаю по погоде дома", - смеется житель Берна. У него еще не было времени для осмотра достопримечательностей, только небольшое кулинарное знакомство с фалафелем и хумусом, но Хенни с нетерпением ждет возможности увидеть город: "Я уверен, что в Тель-Авиве еще много красивых мест, которые можно открыть!". 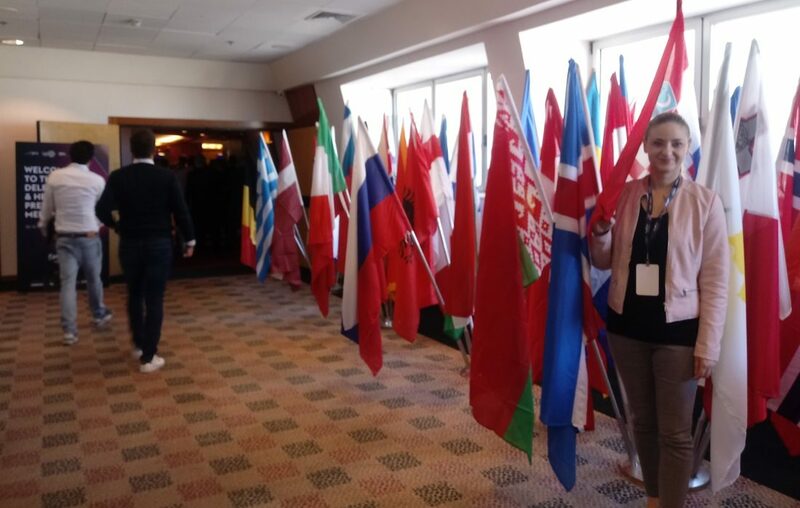 Еврокафе Евровидения 2019 расположится в клубе Ha-Oman 17, и будет открыто с воскресенья 12 мая до вечера финала конкурса. Еврокафе будет организовано ОГАЕ Израиль вместе с VIVO Productions, компанией, которая работает над шоу Офера Нисима и мероприятиями Тель-Авивского прайда. Гостями шоу станут участники конкурса этого года, прошлых лет, а также местные популярные исполнители. Дополнительная информация: страница организации конкурса. Антония Гиговска была подтверждена в качестве бэк-вокалистки Тамары на Евровидении 2019. Она также участвовала в конкурсе Евровидение в прошлом году, присоединившись в качестве бэк-вокалистки к группе "Eye Cue". Недавно она начала свою сольную карьеру с пары успешных синглов и победы на македонском и румынском музыкальных фестивалях. Она также выступает в шоу Pinkove Zvezdice. Полиция Израиля требует от вещательной корпорации и муниципалитета Евровидения-2019 дополнительно 10 млн шекелей (2,5 млн евро) на предоставление услуг безопасности, сообщает Timeout. В то же время корпорация и муниципалитет не планируют финансировать требования полиции из своего бюджета, и они передают ответственность в канцелярию премьер-министра, который обещал, по словам корпорации, финансировать безопасность мероприятия из отдельного бюджета. Новое требование полиции связано не с самими шоу Евровидения, а с другими событиями, которые будут проходить по всему городу, в том числе с Евродеревней. Кроме того, дополнительный бюджет должен использоваться для усиления полицейских сил по всему городу для обеспечения безопасности, регулирования дорожного движения и тому подобного. Это в дополнение к строгой безопасности на месте проведения самого мероприятия в Тель-Авив Экспо, стоимость которого была заложена корпорацией заранее в бюджете в размере 10 миллионов шекелей. Эта система будет организована сторонней компанией, нанятой для этой цели корпорацией. KAN ясно дает понять, что не намерен финансировать дополнительные расходы на безопасность, требуемые полицией, и что они ожидают, что канцелярия премьер-министра выполнит свои обязательства по выделению отдельного бюджета на эту тему. Считается, что муниципалитет придерживается аналогичного мнения. Однако KAN добавляет, что между сторонами ведутся дискуссии, и они надеются, что кризис будет урегулирован в ближайшее время. Полиция прокомментировала публикацию: "Вопреки тому, что утверждается, требуемая сумма значительно ниже, и организаторы и корпорация знали это очень хорошо, это похоже на другие события аналогичной величины, и бюджетные требования были известны более чем месяц. В случаях такого масштаба, есть много сложных аспектов безопасности, которые следует учитывать, разведывательную картину, характер и масштаб события, состав участников события, условия и физическую среду и т. п. Мы будем продолжать работать вместе со всеми соответствующими должностными лицами над решением проблемы и завершением оперативной подготовки и мероприятий, необходимых для проведения конкурса Евровидения". Группа Hatari, которая будет представлять Исландию на конкурсе Евровидение в мае этого года, вчера вечером получила премию "Исполнитель года" в категории поп, рок, рэп и электронная музыка на церемонии вручения премии Icelandic Music Awards. Пропустив обычные благодарности при принятии премии, участники группы вместо этого сразу же высказали политическое послание премьер-министру страны. На сцене Маттиас Трюгви Харальдссон заявил, что Hatari являются активными сторонниками премьер-министра Исландии Катрин Якобсдоуттир (Лево-зеленое движение), но "Пришло время определиться, действительно ли Исландия принадлежит к группе стран с соблюдением правам человека и демократией и равенством, в качестве руководящих принципов. Мы немного confused", - признался он. Его комментарии широко интерпретируются как реакция на известное решение этой недели, вынесенное Европейским судом по правам человека, о том, что министр юстиции Исландии нарушил закон при выборе судей для назначения в новый апелляционный суд (Landsréttur), который был создан в начале прошлого года. Суд также подверг критике парламент, президента и Верховный суд Исландии за то, что они не предотвратили нарушения министром закона, гарантирующего людям свободный и справедливый суд. Вчера министр ушел в отставку, но многие из его сторонников по Партии независимости обвиняют Европейский суд, а не исландских политиков. Премьер-министр Катрин Якобсдоуттир вынуждена объединять обе стороны, но ее правительству может быть трудно критиковать и обжаловать решение, одновременно приветствуя его и предпринимая шаги по исправлению выявленных недостатков. Заявление Hatari было весьма характерных для умных и политически настроенных музыкантов, которые выходят на Евровидение, где открытые политические заявления противоречат правилам. Греческая делегация провела пресс-конференцию, посвященную Евровидению. В конференции приняли участие глава делегации Мария Куфопулу, директор по корпоративным коммуникациям ERT Панайотис Цолиас, руководитель пресс-службы ERT этого года, Ирини Яннара, управляющий директор MINOS EMI / Universal, Маргарита Маца, представительница Греции Катерина Дуска, Алексия Стурнара от имени MINOS EMI / Universal, генеральный директор ERT Иоаннис Дросос, председатель совета директоров ERT Димитрис Пападимитриу, комментатор ERT Евровидение Мария Козакоу, один из композиторов "Better Love" Leon of Athens (Тимолеон Веремис) и режиссера греческого номера Эфи Гусси, пишут OGAE Greece и Eurovision Fun. Панайотис Цолиас от имени ERT еще раз подчеркнул, что задача греческой делегации в этом году - принести победу. Димитрис Пападимитриу объяснил, как проходил процесс национального отбора, отметив, что его опыт, полученный им во время участия в Евровидении в прошлые годы, очень помог в процедурах этого года. Он пояснил, что основным приоритетом комитета на этот год было найти достойную и артистичную заявку, и Катерина Дуска была его личным предложением. Он считает, что выбор Дуски открыл Евровидение для независимой музыкальной сцены Греции, которая представляет удивительные возможности. Он добавил, что национальный финал остается вариантом на будущее, но он думает, что было бы трудно привлечь артистов такого уровня как Дуска, для участия в нем. Катерина Дуска сказала, что она очень гордится предложением ERT, и поблагодарила за доверие к ней. Она говорит, что вся команда Евровидения объединена общей осью, и они работают не покладая рук, чтобы добиться наилучшего результата в этом увлекательном путешествии. Она нацелена очень оптимистично и верит в успешный результат, хотя все будет оцениваться на сцене конкурса. Ее любимые песни из других стран в этом году - Нидерланды, Италия и Португалия, и она также любит Тамту, с которой они поддерживают друг друга. Вопреки тому, что было упомянуто ранее, Дуска посетит несколько европейских промо-вечеринок, и ей нравится эта возможность показать свои вокальные навыки. Маргарита Маца рассказала, что выбор Катерины Дуски был непредсказуемым сюрпризом для рекорд-лейбла, и их цель не в том, чтобы конкретно выиграть, а в том, чтобы динамично вернуть Грецию в эпицентр Евровидения, конкурса, который она назвала "артистическим спортом"! Она считает, что Евровидение может предоставить Катерине огромную возможность для европейской карьеры. Мария Куфопулу рассказала о встрече глав делегаций и заявила, что израильтяне готовят очень масштабный конкурс. Что же касается съемок открыток, то здесь нет установленной даты, так как некоторые из них были перенесены, и согласно первоначальному плану съемки должны были уже состояться. Эфи Гусси подчеркнула, что в сценическом номере Греции будет преобладать театральный стиль, как это можно было уже увидеть в клипе. Продажа билетов на Евровидение возобновится сегодня в 19:00 Москвы. Билеты можно приобрести через веб-сайт Leaan, официального билетного агента Евровидения 2019. В рамках текущего раунда продаж будут предлагаться билеты на полуфиналы и на все генеральные репетиции. 220 билетов на финальное шоу, возвращенные Leaan, будут предложены в следующем раунде продаж в апреле. В этом раунде финальные билеты будут продаваться только в Green Room VIP. Перед тем, как отправиться в международное турне для продвижения "On the Sunday" Эстер Пеони, представительница Румынии, проводит много времени, встречаясь со зрителями в своей родной стране. Певица уже присутствовала на Pulse de Zilei и Telejurnal Matinal, и в эти дни она посещает радиостудии. Неделя началась со встреч на ProFM и Bucharest FM, в пятницу утром она будет на Digi FM, а на следующей неделе появится на Magic FM. Также в четверг Эстер станет гостем шоу Каталина Маруцэ на ProTv в 15.00. Эстер Пеони, победительница национального румынского отбора на Евровидение, приняла в программе радио Pro FM Dimineața Blană вызов пройти тест на знание конкурса Евровидение. До этого она исполнила акустическую версию своей песни "On A Sunday". Многие задавались вопросом, откуда происходит сценическое имя Эстер Пеони. Эстер Александра Крецу объяснила: "Имя - это то, как моя мама придумала назвать меняя. А Пеони - происходит от английского названия пиона, потому что маму зовут Бужорица, что с румынского переводится как пион. Я хотела установить связь между собой и ней. Я провела 5-6 лет в Канаде, я ходила в школу там. Мало-помалу моя мама отправила меня на пение, и им я стала заниматься усиленно после того, как уехала из Канады в 2001 году. Первый час пения был с джазовой вокалисткой, которая научила меня различным техникам. Я начала слушать много музыки и вдохновляться от разных артистов, чтобы я тоже мог стать певицей". Говоря об "On A Sunday", Пеони отметила: "Это моя первая попытка на Евровидении. Я очень верю в эту песню, и, насколько я слышу песни из других стран, многие из них тоже радийные, как и моя". Во время теста Евровидения ведущие Мадэлина Петре, Себастьян Коцофанэ и Раду Цибулька исполнили несколько композиций румынских артистов, которые участвовали в конкурсе. Среди выбранных песен были треки Дана Биттмана, Люминицы Ангел и Sistem, Елены Георге, Mandinga. Вы можете увидеть, как Эстер удалось угадать и напеть их ниже. Норвежский вещатель NRK объявил о возвращении превью-шоу Adresse Tel Aviv. Оно будет состоять из четырех выпусков, его съемки пройдут 26 марта, 17:45, 27 марта, 17:15, 28 марта, 16:15 и 19:15 в NRK Marienlyst в Осло. Желающие принять участие в съемках должны заполнить форму. "Мы с нетерпением ждем возможности провести несколько приятных часов с полными энтузиазма фанатами", говорит Стиг Карлсен. Ноэль Карран, генеральный директор Европейского вещательного союза, направил резкое письмо министру финансов Израиля Моше Кахлону с настоятельным призывом немедленно перечислить 70 млн. шекелей в вещательную корпорацию KAN, чтобы покрыть расходы на проведение Евровидения в Израиле: "Я срочно пишу вам как генеральный директор ЕВС, союза представляющего 117 общественных вещателей в 56 странах, относительно финансирования Евровидения 2019. К сожалению, мы обнаружили, что вопреки предыдущим заявлениям, сделанным во время наших встреч в Израиле, 70 миллионов шекелей, которые вы должны были перечислить в KAN для финансирования Евровидения, были переданы корпорации только в виде кредита на 15 лет", цитирует газета Haaretz. Карран ясно дал понять в своем письме, что неспособность перевести необходимые ресурсы для финансирование Евровидения представляет проблему для ЕВС. "Чрезвычайные изменения в финансировании конкурса вызывают особую тревогу, поскольку они могут нанести существенный вред способности KAN функционировать в качестве органа общественного вещания". "Решение правительства о нефинансировании ставит под угрозу способность KAN выполнять свои обязательства по закону, в частности создание разнообразных программ на различных платформах, призванных принести пользу израильской общественности, как это указано в Законе об общественном вещании. Вы должны принять решение о финансировании конкурса и также выполнить обещание о финансировании безопасности Евровидения, а также о нормальном функционировании корпорации KAN, чтобы мы могли продолжать бесперебойно работать над событием, которое продемонстрирует Израиль всему миру ". Это не первый случай, когда ЕВС направляет выдержанное в таком духе письмо правительству Израиля. Йон Ола Санд, супервайзер Конкурса Песни Евровидение, в прошлом месяце направил резкое письмо премьер-министру Биньямину Нетаньяху, протестуя против того факта, что бюджет для мер безопасности вокруг Конкурса Песни Евровидение до сих пор не предоставлен. Главный продюсер Eesti Laul Томи Рахула принял участие во встрече глав делегаций, чтобы определить последние планы по организации сценического номера Виктора Крона и решить другие вопросы, такие как съемка посткарда. "Приедет ли Саара Кадак в Тель-Авив? Мы не можем ответить на этот вопрос сегодня,", Томи смеется и говорит, что это станет ясно через две недели. "Мы до сих пор не знаем точно, как будет выглядеть наша постановка. Мы выслали все материалы, и в эти выходные сотрудники ЕВС встретятся с теми, кто входит в режиссерскую команду. В начале следующей недели мы получим больше информации, и тогда мы примем некоторые решения. Картина должна стать ясной к концу марта", говорит Рахула, подтверждая, что в постановке сейчас есть два варианта. "Мы по прежнему мыслим в одном направлении, и постановка будет придерживаться той же темы, но мы хотим улучшить ее. Сама песня останется такой же, мы не меняли ее, но мы должны были представить ее в видео отдельных треков". Виктор снимет свой посткард в начале апреля. Фактически, он должен был сделать это уже в марте, но погода в Израиле была немного неподходящей. "У них есть особенное место для нас, и у нас не получилось сделать это, потому что в это время была дождливая погода." "Я приехал домой из Израиля в понедельник вечером, потому что мой сегодняшний московский рейс был отменен, и я должен был приехать ночью, потому что мне нужно быть в Таллине завтра, но помощница Лаура-Лииза осталась там, чтобы посмотреть место проведения конкурса, объясняет Томи. "Этот выставочный центр по-прежнему совершенно пуст, там еще ничего не было построено, но уже на следующей неделе туда отправятся первые грузовики и скоро начнется стройка. Это будет довольно захватывающе"..
Кроме того, уже ведутся работы над "Eesti Laul" следующего года. "Мы работаем над новым набором правил, и мы хотим, чтобы весной все было уже готово, чтобы осенью было легче. К концу апреля я бы хотел сделать много вещей". Появление Мадонны на Евровидении в опасности - из-за содержания одной из песен, которую она предложила исполнить. Портал Ynet узнал, что представители Мадонны прислали список песен, которые она, как ожидается, хотела бы исполнить на сцене в Тель-Авиве - и одна из них (песня, которая еще не была выпущена) была сочтена довольно сомнительной организаторами конкурса. При этом, генеральный директор телеканала-организатора призвал не вмешиваться в художественный выбор исполнительницы. Сообщалось, что в начале марта Мадонна сняла новый видеоклип на песню, которая должна выйти в следующем месяце. Известный фотограф Люк Остин, принимавший участие в съемках, прокомментировал: "Я просто рыдал. Песня отличная. Видео политическое. Видео будет противоречивым. Она была великолепна". Однако, не ясно, соответствует ли данный клип той спорной песне, которую Мадонна хочет исполнить на сцене Евровидения. В любом случае, у организаторов Евровидения в Израиле есть запасной план на случай, если выступление Мадонны в конечном итоге по той или иной причине не состоится. Телевещательная корпорация KAN в сотрудничестве с BLEE Hackathons приглашает разработчиков, дизайнеров, предпринимателей и создателей продуктов принять участие в двухдневном марафоне по развитию и инновациям - "EUROHACK - хакатон Евровидения", нацеленном на разработку и создание решений для обеспечения доступности и опыта просмотра конкурса Евровидение. Команды-победительницы получат билеты на шоу Евровидения в качестве призов. Хакатон состоится в четверг, 4 апреля, и продлится до полудня пятницы, 5 апреля в пространстве Microsoft Reactor в Тель-Авиве. Приглашаются дизайнеры, кодировщики, разработчики, предприниматели, которые хотят раскрыть свои таланты и способности для конкурса песни Евровидение. Будет две основные задачи: вызов по доступности от KAN - улучшение специальных решений для зрителей с ограниченными возможностями и вызов опыта просмотра от OGAE - совершенствование и максимизация впечатлений от просмотра Евровидения для фанатов по всей Европе. В конце мероприятия коллегия судей, состоящая из представителей компаний-партнеров, выберет десять проектов, которые наилучшим образом соответствуют критериям. В течение трех недель после мероприятия отобранные команды при поддержке наставников будут работать над разработкой своих решений, как в технологическом, так и в деловом плане, чтобы довести их до стадии внедрения. Десять команд представят свои проекты на праздничном мероприятии во вторник, 30 апреля. Команды получат баллы в формате Евровидения 1-12, а в конце мероприятия будет объявлен победитель. Участники из 16 стран Африканского континента представили заявки на участие во втором выпуске конкурса песен AfriMusic. Этап подачи заявок завершился 17 февраля 2019 года. Южная Африка и Гана представили наибольшее количество заявок, за ними следуют Нигерия и Королевство Эсватини. По сравнению с прошлым годом не были получены заявки из ЦАР, Чада, ДР Конго, Египта, Эфиопии, Габона, Гвинеи, Танзании и Зимбабве. К конкурсу присоединились: Либерия, Малави, Руанда, Сенегал, Того и Замбия. За две недели рассмотрения всех заявок на участие в национальных отборах организаторы конкурса AfriMusic убедились, что они соответствуют правилам и положениям конкурса. Заявки из 13 из 16 стран были подтверждены для участия, к сожалению, песни из Того, Либерии и Ботсваны выбыли из борьбы. "В общей сложности 20 участников будут отобраны на основе количества полученных ими голосов для участия в финале конкурса в этом году. Все страны с утвержденными заявками могут участвовать, что делает конкурс полностью инклюзивным, при условии, что они соответствуют правилам и положениям конкурса. В настоящее время этот метод получил положительный отклик, и мы рады видеть результаты" - говорит Сьюзи Висенте, директор по развитию бизнеса и спонсорству конкурса AfriMusic. Финалисты будут объявлены, и финальная фаза конкурса начнется с 29 марта 2019 года, продлившись до 12 апреля 2019 года. Процесс голосования останется таким же, как и в 2018 году, когда все 20 песен вновь будут оценены жюри и публикой. Результаты голосования как в национальных отборах, так и в финале конкурса будет подсчитываться в соотношении 50/50, учитывая мнение жюри и голоса публики. Публика и члены жюри имеют возможность прослушивать утвержденные песни на цифровых платформах AfriMusic и уже могут проголосовать за свои любимые песни. Дополнительная информация о процессе и голосовании доступна на Официальном сайте конкурса. Вы также можете прослушать все записи на официальном канале Youtube и проголосовать здесь. Конкурс песен AfriMusic является крупнейшей музыкальной платформой в Африке, которая включает в себя все 54 страны, создавая равные возможности для новых музыкальных талантов на континенте. Конкурс песен AfriMusic направлен на обучение, расширение возможностей и предоставление платформы авторам неизданных песен, композиторам и певцам по всей Африке путем создания позитивного и уверенного образа единой Африки посредством музыки, как внутри самого континента, так и на международной арене. Африканцам, стремящимся продемонстрировать свои таланты и представить свою страну со своими музыкальными достижениями, теперь предоставлена ​​возможность продемонстрировать свои песни широкому кругу слушателей. В 2018 году первую победу одержала певица Symphony из Королевства Эсватини с песней Sengikhona, и организаторы конкурса с нетерпением ждут возможность увидеть, какой исполнитель и страна получат титул в 2019 году. В качестве приза AfriMusic Symphony получила поездку в Лиссабон, где она выступила в Евродеревне в присутствии 20 000 зрителей, а ее выступление транслировалось в прямом эфире для 186 миллионов зрителей на канале RTP, общественном вещателе Португалии. "Поездка имела огромный успех и открыла глаза поклонникам Евровидения, когда они смогли поприветствовать африканскую красавицу на сцене Евродеревни, Евроклуба и несколько других мест в течение недели конкурса Евровидение. Публика была просто наэлектризована, когда Symphony вышла на сцену, и она смогла представить Африку в привлекательной и вдохновляющей манере. Так что и фанаты теперь с нетерпением ждут того, кто будет следующим артистом, которого Afrimusic покажет Европе", говорит управляющий директор конкурса песен AfriMusic Мишель Фернандес. Представительница Кипра репетирует свою открытку для Евровидения с танцорами в Эйлате. В интервью Télépro, композитор бельгийской песни Пьер Дюмулен рассказал о работе с Элиотом и планах подготовки к Тель-Авиву. "Знакомство с Элиотом прошло более или менее по такому же сценарию, как и с Бланш. Я увидел его прослушивание на "Голос Бельгии", и почувствовал что-то особенное... К артистам меня привлекает прежде всего голос, но я никогда не ищу совершенной техники. Должны возникнуть эмоции, должно быть что-то, что меня тронет. Я не знаю, как объяснить это словами... У Элиота есть особый стиль, способ выразить свой голос, который заинтересовал меня. Мы познакомились и написали две песни вместе, но "Wake Up" уже была написана до этого. Я не сочиняю песен специально для Евровидения, единственное, что я делаю, это уважаю правило по продолжительности песни. Я всегда инстинктивно создаю музыку, которая говорит со мной и соответствует мне. Когда мы встретились, то я сказал ему довольно быстро, что сейчас год RTBF на Евровидении, и я предложил ему попробовать. Я очень хотел вернуться туда. Евровидение - это параллельный мир, я даже вернулся в Лиссабон в прошлом году, чтобы пережить эту атмосферу. Он оказался заинтересован сразу. Вот что хорошо с новым поколением. Артисты моего возраста не очень интересуются Евровидением. Для нас было бы очень неудобно идти туда открыто. А молодежь поняла, что это хороший способ заявить о себе. Песня существовала как демо без текста. Мы сидели за столом, обсуждали идеи, и его желанием было написать что-то, вызывающее к совести народа. Все это произошло еще до протестов по поводу климата в Бельгии в феврале. Поэтому мы решили передать этот посыл, посыл поколения, которое хочет двигаться вперед. В итоге жюри сделало свой выбор среди 25 демо композиций. Наш план для Евровидения - попробовать повторить видеоклип, но только с 6 людьми на сцене. Там будут экраны, и мы, возможно, будем их использовать, тем более что сцена будет гигантской. Они сыграют свою роль в спектакле"
Дюмулен также рассказал, что имел контакты с киприотской делегацией и получил от них предложение написать песню для конкурса 2018 года, но это не сложилось. "Я думаю, что в основном потому, что у меня есть определенный бренд, и я говорю это сам: RTBF поступает очень смело, доверяя мне дважды подряд. Мои песни не очень форматны по сравнению с Fuego от Кипра в прошлом году. Когда я увидел, что они в конечном итоге выпустили, и их песня оказалась очень эффективной, я не знаю, как делать такие вещи... Им интересно сотрудничество со мной, но осмелятся ли они пойти до конца?" Участник из Хорватии Роко в настоящее время находится в Израиле, чтобы снять свою открытку для Евровидения 2019. - Три дня пребывания в Израиле и Тель-Авиве были наполнены интенсивной подготовкой, новыми контактами и проделанной работой. Я встретил много людей со всей Европы, и производственную команду на самом высоком уровне - я в восторге от работы и творческих решений официального режиссера и всех ее партнеров. Мы сняли открытку, которая будет транслироваться перед моим выступлением, и сейчас я могу рассказать, что мы записали ее в действительно особенном месте, в нескольких местах, и она будет очень оригинальной, молодой и танцевальной, согласно слогану этого сегмента -"Танцы в Израиле!". Съемка была очень сложной, она длилась с 6 утра до позднего вечера, но она окупилась, и я не могу дождаться, когда увижу открытку. Израиль - замечательная страна, и принимающие хозяева великолепны - они вкладывают много усилий во весь процесс, и меня особенно поразил тот факт, что наша песня привлекла большое внимание и они разработали идею открытки с подробным описанием концепции. Я горжусь тем, что им очень понравилась наша песня, а также выступление с Доры, и мы прилагаем большие усилия, чтобы улучшить это выступление. Я с нетерпением жду возвращения в Израиль в мае, когда я с большой радостью и гордостью буду представлять Хорватию на самой большой в мире музыкальной сцене! ", - с радостью сказал Роко. Роко прибыл в Израиль вместе с новой главой хорватской делегации на конкурсе Элизабет Хомси. - Номер Роко уже был продуман до мельчайших деталей, креативно и значительно улучшен по сравнению с исполнением, которое мы смогли увидеть на Dora, так что перед производственной командой Евровидения стоит интересная задача визуализировать и оживить хорватскую "The Dream" с помощью бесконечных технических возможностей Евровидения. Могу сказать, что телешоу Евровидения 2019 предложит целый ряд оригинальных и креативных решений, которые мы раньше не видели на сцене этого конкурса. .
У молодой телеведущей Эммы Вортельбур была одна мечта: стать глашатаем Нидерландов в финале Евровидения-2019. Эмма сняла серию видео о своей страсти к Евровидению, #EmmaDouzePoints, которые были показаны в рамках популярного телешоу DWDD. В них ее к такой важной задаче готовили различные эксперты конкурса песни. И это принесло результат, потому что в субботу 18 мая Эмма действительно объявит очки голландского профессионального жюри. В предыдущих конкурсах роль глашатая Нидерландов обычно играл прошлогоний артист. Уэйлон, который представлял Нидерланды в 2018 году и традиционно объявлял бы баллы в этом году, с радостью передал Эмме эту роль. Ранее они закрепили его благословение с помощью татуировок Ding-a-Dong на своих руках. В интервью норвежскому вещателю NRK супервайзер конкурса Йон Ола Санд отметил, что он провел диалог с делегацией Исландии на конкурсе и предупредил ее о последствиях, если их конкурсанты Hatari будут использовать Евровидение в политических целях. "Мы не считаем, что они будут использовать конкурс Евровидение для протестов. Они знают о правилах конкурса, и что использование его в политических целях недопустимо. Но если они все-таки сделают это, то мы можем исключить их из числа участников". "Мы не видим никаких причин, почему им могли бы отказать во въезде. Мы ведем тесный диалог с правительством Израиля, и они знают, что отказ во въезде кому-то из участников конкурса может иметь неприятные последствия для местных организаторов". Новая система голосования в Melodifestivalen произвела только одно большое отличие: Лина Хедлунд вышла в финал из третьего полуфинала вместо Ребекки Карлссон. При старой системе подсчета очков Йон Лундвик вышел в финал бы только со 2-го места, уступив Бишаре. В финале Лундвик получил 12 баллов от 6 из 8 групп телезрителей. Также было уже известно, что места 6 и 7 сменились бы между Оскаром Энестадом и Яном Мальмшё в их полуфинале. В полуфинале 4 Анна-Луиза Хансон выиграла от новой системы, она была бы последней со старыми правилами голосования, но финишировала пятой с новым подсчетом. Антон Хагман финишировал 6-м, будучи 5-м по старой системе, а Pagan Fury были бы 6-ми, а не последними. При старой системе зрители в финале оценивали бы Викторию как 6-ю вместо 8-й, Лизу Аякс как 7-ю вместо 9-й, Арвингарну как 8-х вместо 6-х и Анну Бергендаль как 9-ю вместо 7-й. Количество голосов в Melodifestivalen побило рекорд и увеличилось почти на 20 процентов по сравнению с предыдущим годом. Статистика из приложения показывает, что число людей, которые решили голосовать, увеличилось, а не отдельные пользователи голосовали более интенсивно, чем раньше. Во время Melodifestivalen 2019 зрители пожертвовали 7 885 467 шведских крон на благотворительность Radiohjälpen. Эта сумма почти удвоилась с прошлого года. Во время финала зрители пожертвовали почти 4,3 миллиона шведских крон, что является самым высоким итоговым показателем за десять лет. Во время Melodifestivalen 2019 номер телефона Radiohjälpen впервые был представлен в качестве первого варианта в эфире. Сумма, собранная во время финала и второго шанса, будет пожертвована для борьбы с гуманитарным кризисом в Йемене. Вы можете прочитать полный анализ результатов (на шведском языке) здесь, сами результаты доступны здесь. В пресс-центре Спутник-Молдова прошла пресс-конференция представительница Молдовы Анны Одобеску при участии ее супруга Александра Вдовиченко. "Мы шли участвовать в этом году с одной целью - победой. Эта песня достойна того, чтобы ее услышала вся Европа. Мы достойно сможем представить наш номер в Европе", отметила Анна. "Мы едем с боевым настроением, мы надеемся пройти в финале, у нас есть чувство, что мы сможем сделать это - нужно думать позитивно и настраивать себя на хорошее. Все мы прекрасно знаем, что политика играет огромную роль на этом конкурсе, и все зависит от того, насколько мы понравимся тем странам, с которыми мы будем сражаться в полуфинале". Певица подтвердила, что и номер и костюм претерпят значительные изменения для выступления в Тель-Авиве. "У нас набирается очень хорошая команда из настоящих профессионалов. Насчет шоу еще не решено ничего окончательно, но одна страна из бывшего Советского Союза хочет помочь нам в этом приключении, предлагают очень интересное шоу, но все зависит от того, как мы найдем финансы и средства. В нашей команде также будут ребята из Sunstroke Project, они поедут с нами в качестве группы поддержки. Также с нами будут наши бэк-вокалисты Михаэла Андрей, Андрей Штефанец и Андрееа Портареску, сами уже известные исполнители, но они не отказали нам, и надеюсь, что они будут с нами до конца", рассказал Вдовиченко. Из уже увиденных ею участников из других стран Одобеску отметила представителя Франции Биляла Хассани "очень понравился, мне нравится такой стиль песни и его вокальная техника", Нидерландов Дункана Лоуренса "замечательная песня и аранжировка", России Сергея Лазарева "у него тоже баллада, нам многие говорили, что баллада это песня не для Евровидения, но я заметила, что в этом году много баллад, и у нас есть большие шансы, я так думаю". Во вторник канадско-израильский миллиардер Сильван Адамс заявил, что "очень хорошие шансы" на то, что Мадонна все-таки выступит на Евровидении в этом году. Адамс, выступая на конференции Keshet INTV в YMCA в Иерусалиме, рассказал, что он принимает участие в переговорах о привлечении на шоу знаменитой американской певицы. "Мы обратились к Мадонне, чтобы попытаться добавить немного блеска конкурсу", - сказал Адамс корреспонденту Channel 12 News Бену Миттельману. "Я оцениваю шансы того, что она приедет к нам и выступит на Евровидении как очень хорошие". В прошлом месяце в прессу просочилась информация о том, что Адамс предложил оплатить счет за то, что 18 мая Мадонна выступит на финале шоу в Тель-Авиве. Ynet сообщал, что Мадонна потребовала более миллиона долларов за свое участие в шоу. , Бюджет KAN на Евровидение 2019 года, частично финансируемый за счет займа, составляет 120 миллионов шекелей. В интервью Omroep Brabant продюсер "Arcade" Воутер Харди рассказал историю создания песни, которая сформировалась в его студии на Роттердамском Маасхавене. Воутер Харди (27) работал с Дунканом Лоуренсом в течение двух лет. Их познакомил музыкальный лейбл Sony ATV. "Это артист, который, я думаю, нам подойдет", - сказали они. Харди получил от Дункана пять демоверсий. Среди них была и очень ранняя версия "Arcade". "Меня особенно поразил его голос, и с ним можно многое сделать". Харди начал работать с Лоуренсом. И "Arcade" была тем номером, над которым они собирались работать в первую очередь. В студии Воутер показывает отдельные треки от "Arcade" на экране. Всего 165 треков. "Я думаю, что это действительно красиво, это струнные, барабаны, басы, пианино, синтезаторы, хор, голос Дункана, конечно же, бэк-вокал, вот почему так много треков". Когда песня была закончена, у него фактически не было ожиданий, и уж точно не то, что она станет фаворитом Евровидения. "Я никогда не ожидал, это сумасшедшие чувства, ты просто не веришь этому, я просыпаюсь каждое утро и вижу десятки сообщений, люди отправляют электронные письма и сообщения в Instagram, это действительно сумасшествие, спустя два года получить результат. Я им очень горжусь". Но Харди до сих пор ничего не загадывает. "Все может пойти в любом направлении, что ты номер один среди букмекеров, конечно, это хорошо, но это также оказывает большое давление, особенно на Дункана. От него многое ожидают. Я думаю, что Дункан - один из лучших живых вокалистов, которых я знаю, он может поражать людей своим голосом, я думаю, что люди будут действительно впечатлены им". Представитель Испании Мики начал репетиции с Фокасом Евагелиносом, художественным руководителем постановки "La venda", и Мамен Маркесом, музыкальным руководителем проекта. Фокас Евагелинос работает с Мики с четверга в Мадриде. Художественный руководитель рассказывает, что мы увидим "фантазию, цвет, взрыв" на сцене через историю, которая отлично передаст посыл "La venda". Евагелинос отметил, что, впервые услышав песню, он почувствовал радость, оптимизм и ощутил, как его затянуло ее ритмом. Он также подчеркнул качества испанского певца: "Он - свежий артист и у него много талантов. И он исполняет песню с большим количеством света. Принадлежит новому поколению молодых людей, искренне волнующихся за то время, в котором они живут". Сам Мики описал постановку в трех словах: "большая, вечеринка, органичная", и о первой репетиции с греческим режиссером рассказал: "Первый контакт с Фокасом был супер хорошим, потому что его инструкции были очень подробными, но в то же время оставляют запас для естественных движений. Это все очень легко и позволяет нам быть самими собой на сцене". Мики не будет один на сцене. Вместе с ним выступят певцы и танцоры Микель Хеннет, Эрнесто Сантос, Фран Герреро, Мария Акоста и Мари Мартинес. Каталонец будет практиковаться следующие несколько недель вместе с Мамен Маркес, его учителем вокальной техники с OT 2018: "Мы будем работать над вокалом, гармониями и, прежде всего, тем фактом, чтобы он звучал мощно и широко и не тонул, когда он на сцене". "У нас будут еженедельные репетиции, на которых он будет петь и танцевать песню одновременно, иногда мы делаем три и четыре последовательных прогона, не останавливаясь, чтобы они могли взять тот фон, который требует тема". Команда репетировала по восемь часов в день в течение пяти напряженных дней, но режиссеры остались довольны результатом, так как и Мики, и его танцевальная команда, и бэк-вокалисты очень дисциплинированы. Мамен признает, что работа с Мики "является подарком", потому что он на 100% привержен тому, что он делает. "На репетициях бывают моменты, когда я прошу его отдохнуть, и он всегда говорит, что если его товарищи по команде работают, он тоже будет делать это, он приносит невероятную энергию и является хорошим партнером", - сказала она. Евроклуб Евровидения 2019 расположится на площадке Hangar 11 в порту Тель-Авива. Клуб будет открыт с 11 по 18 мая ежедневно с 21:00 до 04:00. Вход свободный для держателей аккредитаций, для членов фан-клубов будет возможность приобрести браслеты. Израиль выступит 14м в финале Евровидения 2019. Поскольку продюсеры шоу определяют порядок выступлений в финале конкурса Евровидение, позиция страны-организатора обычно определяется жеребьевкой во время встречи глав делегаций. Эту почетную роль под четким наблюдением Йона Олы Санда выполнила глава делегации Кипра, страны проигравшей Израилю в прошлом году, Эви Папамихаил. В итоге, Израиль получил 14е место в финале конкурса. В состав авторов песни Сербии добавился аранжировщик Дарко Димитров, в соавторы Эстонии - Sebastian Lestapier, в Норвегии - Rûdiger Schramm. Элиот Васамийе указан соавтором своего трека. Автор текста песни Грузии - Диана Гиоргадзе. Из авторов песни Франции пропали Билял Хассани и Medeline - она записана только на Madame Monsieur, у Сан-Марино пропала Мэри Сюзан Эпплгейт - теперь автор только сам Серхат. Уточнен состав авторов в Швейцарии, теперь музыка записана на Jon Hällgren и Lukas Hällgren, а Laurell Barker, Mac Frazer, Luca Hänni, Jon Hällgren, Lukas Hällgren указаны авторами слов. В Российской заявке авторами музыки указаны Филипп Киркоров, Димитрис Контопулос, авторами слов: Шарон Вон, Димитрис Контопулос.У Кипра Teddy Sky в соавторах музыки указан под псевдонимом, а в соавторах текста - под своим настоящим именем Geraldo Sandell. Во время встречи глав делегаций прошли выборы на три позиции в Организационной группе Евровидения, которая является исполнительным органом конкурса от имени всех участвующих вещателей. Итальянский представитель Никола Калиджоре из RAI и Александр Радич из словенской телекомпании RTVSLO были переизбраны, также был избран глава делегации Швейцарии Рето Периц. Голландка Эмили Сикинге из AVROTROS покинет группу после двух сроков полномочий. Вновь выбранная референтная группа приступит к работе после конкурса в Тель-Авиве, когда к ней присоединится исполнительный продюсер конкурса 2020 года. Вчера главы делегаций, участвующих в конкурсе песни Евровидение 2019, собрались в Тель-Авиве на специальную встречу. В течение трех дней для них пройдут профессиональные конференции и экскурсии, в том числе посещение выставочного центра "Тель-Авив Экспо". На встрече также присутствуют высокопоставленные чиновники ЕВС во главе с Йоном Олой Сандом, исполнительным супервайзером конкурса, мэр Тель-Авива Рон Хулдаи, руководители телекомпании KAN, исполнительный продюсер Зивито Давидович, режиссер конкурса Юваль Коэн и Тали Кац, глава израильской делегации. 2. Видеоклип песни, который будет использоваться в качестве превью видео. - не позднее, чем встреча глав делегаций. 8. Предоставление доступа к участвующей песне на всех легальных платформах для скачивания и потоковой передачи. - Как только песня выбрана. Если правообладатель не располагает необходимыми для этого ресурсами, то он должен предложить распространение трека лейблу, назначенному ЕВС. - не позднее даты заседания глав делегаций. - не позднее даты встречи глав делегаций. После этого изменения допускаются только с согласия ЕВС и KAN. Никакие изменения или исправления не будут более допускаться, и этому не должно быть никаких исключений, за 30 дней до первого полуфинала (14 апреля). Весь материал должен быть подан путем загрузки во внутреннюю сеть Евровидения. - Если выбранная песня (вместе с минусовкой) не поданы в срок. - Если язык исполнения песни или название выбранной песни были изменены после встречи глав делегаций. - Если текст песни, биография и фотографии конкурсанта и другая информация для официального веб-сайта и официальных альбомов не предоставляется в установленный срок. - Если какой-либо другой материал не предоставлен в срок. Вы можете найти более подробную информацию в нашей предыдущей публикации относительно правил Евровидения (по состоянию на 2016 год). KAN и ЕВС запустили официальную игру по оценке песен Евровидения 2019 под названием "Douze or Boos". Слушатели смогут познакомиться с 20-секундными фрагменты каждой участвующей песни без указания имени исполнителя или стран, которые они представляют. Цель проекта - сосредоточиться на любви к музыке без политического влияния. Песни отображаются в Tinder-подобном интерфейсе, позволяя каждому пользователю указывать, нравится ли ему песня или нет, основываясь только на музыкальных предпочтениях. Кроме того, пользователи смогут создавать список любимых треков из песен, участвующих в конкурсе, и делиться своими предпочтениями в социальных сетях. Игра разработана технологическим агентством Rabbi Interactive. Гил Рабби, генеральный директор Rabbi Interactive, сказал: "Мы разработали продукт в духе Евровидения для любви к музыке с намерением отойти от внешних влияний, таких как политика, что позволит фанатам соревнований соединяться с их любимыми песнями без каких-либо предубеждений". Напомним, что неофициальный сортировщик фаворитов от Mr. Gerbear вы можете найти здесь. Номер Израиля на домашнем Евровидении будет исполнен 27-летним Коби Марими, который обладает уникальными вокальными данными и неповторимой индивидуальностью. C "Home" в качестве конкурсной песни, Коби определенно продемонстрирует элегантность и мощное выступление на сцене Евровидения. "Home" была написана Инбар Визман и Охадом Шрагаем, авторами и исполнителями из Тель-Авива. "Home" - это "душевная баллада", в которой госпел и современный соул соединяются с ближневосточными мотивами. Текст песни посвящен жизненному пути самого Коби; Долгий и сложный поиск собственной самооценки. Когда он обретает мир со своей истинной сущностью и принимает себя, приходит осознание того, что его сердце жаждет ДОМА. Видеоклип был снято одним из ведущих израильских режиссеров, Гаем Саги, который также снял "Diva" Dana International, победительницы Евровидения 1998 года. Видеоклип был снят в черно-белом цвете с использованием классических техник съемок, которые выставляют Коби в центр клипа и подчеркивают его уникальный вокал. Участие Израиля в Евровидении этого года, во второй раз, является совместным производством Tedy Productions, одного из самых известных и влиятельных контент-и продакшн-центров в израильских СМИ, KAN, Израильской общественной телерадиовещательной корпорации и крупнейшей медиа-компании Израиля с 3-мя вещательными платформами и Keshet 12, ведущей в стране коммерческой телекомпании. "Walking out" была написана двумя армянскими музыкантами "Lost Capital" и "tokionine". Текст песни написал Гарик Папоян, который также работал над треком Aram MP3 "Not Alone". "Когда я впервые услышала мелодию, перед моими глазами вспыхнули видения. События, которые еще не стали воспоминаниями ... Я поняла, что эта борьба и подавление эмоций внутри меня должны быть отражены в моей песне. Я хочу сказать себе и всем остальным: "Не убивай любовь, но не позволяй ей убивать тебя", - говорит Србук. Песня представляет собой конфликт эмоций, монолог, который может быстро превратиться в диалог. Вопросы без ответов, борьба внутри себя, сила и решимость двигаться дальше. Видеоклип был подготовлен "Factory Production". Режиссер - Артур Манукян, DOP - Артем Абовян, стилист - Ани Месропян, хореография - Ованес Саргсян. "Мы хотели визуально изобразить эмоции в любящем сердце, которое было предано. Когда вы думаете, что будете наполнены радостью, но вместо этого не хватает воздуха, чтобы дышать. Когда вы хотите поделиться своим счастьем, но вместо этого вы начинаете терять себя: ваши руки связаны, ваши эмоции подавляют, вы продолжаете притворяться, чтобы просто поддержать свою любовь. Но чего вы ждете? Как долго вы можете играть по этим правилам? Это вопросы и эмоции, отображаемые в клипе", - говорит Србук. Видеоклип несет в себе много символов и месседжей, подсказок, которые каждый человек будет интерпретировать индивидуально, поскольку эти чувства универсальны, но результат всегда уникальная история. PBS выпустила песню, которая будет представлять Мальту на предстоящем конкурсе Евровидение в Тель-Авиве. Микела Пач с ее отчетливым и запоминающимся голосом исполнит "Chameleon". 'Chameleon' - это жизнерадостная, быстротемповая песня с современным поп-звучанием, грувом Reggaetone, а также с кубинскими оттенками. Песня была написана и спродюсирована Symphonics, которые уже занимали 2-3-4 места на Евровидениях за последние три года. Это вторая песня болгарского автора Борислава Миланова на Евровидении 2019 после Азербайджана. "Chameleon" была записан в Вене, Швеции и на Мальте, в то время как видеоклип был снят на Мальте и спродюсирован PBS. Посвятив последние дни доработке выбранной песни и съемкам музыкального клипа, в ближайшие недели Микела продолжит подготовку к выходу на сцену Евровидения 16 мая 2019 года. Shurat HaDin, Израильский юридический центр - неправительственная организация по гражданским правам, которая занимается представлением жертв террора, обратилась к министру внутренних дел с просьбой не допускать въезд членов группы Хатари в Израиль, сообщает Yedioth Ahronoth. Основатель организации Ницана Даршан-Лейтнер говорит: "Мы получили информацию о том, что группа, представляющая Исландию, поддерживает бойкот Израиля. Летом прошлого года группа подписала петицию, распространенную в Исландии, призывающую к бойкоту Евровидения. Группа Хатари объявила, что намерена протестовать против Израиля на сцене Евровидения, несмотря на то, что это противоречит правилам конкурса. Согласно поправке к Закону о въезде в Израиль, виза и вид на жительство в Израиле не будут предоставляется лицу, которое не является гражданином Израиля или имеет постоянный вид на жительство в Израиле, если он или организация или орган, на который он работает, сознательно обратились с публичным призывом бойкотировать Израиль, как это определено в документе "Предотвращение вреда для государства" Закона Израиля. Исландская группа публично и недвусмысленно призвала к бойкоту Израиля и поддержала его. Им должен быть запрещен въезд в страну". Скандальный бывший депутат Кнессета Орен Хазан также заявил, что группа не должна быть допущена в страну. "Конкурс песни Евровидение не предназначался для того, чтобы служить платформой для антисемитов, которые делегитимизируют государство! Не дадим правительству уснуть на страже страны - это его обязанность помешать им въехать в Израиль. Если бы я решал, они остались бы в аэропорту Бен-Гуриона и пели там для стены", - написал он. Министр внутренних дел Арье Дери ответил, что дело будет рассмотрено совместно с министерством по стратегическим вопросам и после этого по нему будет принято решение. Йон Лундвик представит Швецию на Евровидении 2019 с песней Too Late For Love. Лундвик также является соавтором песни Великобритании в этом году. Это - последний выбранный участник для конкурса. Представлена конкурсная заявка России - "Scream". Она была написана и спродюсирована Филиппом Киркоровым и Димитрисом Контопулосом на стихи Шарон Вон (Ирландия 2012). "Ну вот и песня "Scream" с которой я в этом году представлю нашу страну на конкурсе Евровидение-2019 в Израиле. Когда я услышал эту песню в первый раз , я почувствовал невероятную силу и мощь мелодии. Потом появился текст и все обрело еще больший смысл. Ну, а режиссер Константин Черепков, снял уникальное и трогательное видео. Я счастлив вновь принять участие в конкурсе Евровидение , на этот раз показав себя с другой музыкальной стороны. Я заранее хочу поблагодарить всех вас за лайки и даже за дизлайки , за репосты и комментарии, за скачивание и прослушивание песни. Потому что все , что мы делали всей командой- было для вас !!! Спасибо всем. ❤", написал исполнитель. Режиссер видеоклипа Константин Черепков говорит: "Сильная мелодия, драматичная лирика песни и мощный вокал Сергея вдохновили меня на создание этого уникального темного клипа - истории духовного взросления героя, борьбы со своими страхами, которые все мы носим с детства, и которые по мере взросления превращаются в "крики". Именно в борьбе с собой можно познать свои силы и возможности. Наш Артист - Сергей Лазарев - в своей жизни по сути проходит тот же путь, преодолевая препятствия и побеждая страхи. Мальчик символизирует нашего героя Сергея, в то время как остров символизирует конечную точку путешествия, которое мы все должны предпринять, чтобы преодолеть наши страхи. Мы решили отойти от любых компьютерных спецэффектов и «синтетической» жвачки, которыми сегодня переполнены экраны и рассказали о чувствах «тёплыми» аналоговыми приёмами. Мы совместили технологии стопмоушен анимации, 2D проекции и декораций, получив сказочно-реалистичный мир, снятый в живую." 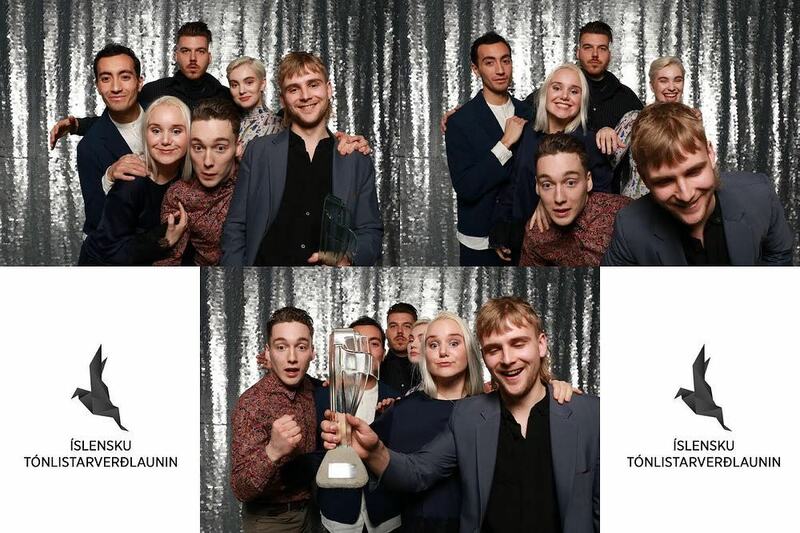 Фотогалерея с жюри финала шведского отбора Melodifestivalen 2019. "Я максималист и очень критически отношусь к себе. Во время моих выступлений в A DAL мы постоянно вносили изменения, но даже после финала я чувствовал, что чего-то не хватает, поэтому я отправился в студию несколько дней назад. Я хотел убедиться, что у меня не было недостатков в песне. Теперь моя совесть чиста, я смог отполировать все, что только возможно. Я не мог спать, пока мы не закончили, но теперь я чувствую силу, которой не было раньше", - рассказал певец в программе "Talpra magyar!" Petőfi Rádió. "Еще до конкурса 2017 года я разговаривал с людьми, которые уже участвовали в Евровидении, они все говорили мне, пытайся просто наслаждаться событиями. Но я не мог сделать это там. Когда я вышел на эту монументальную сцену, я почувствовал, как у меня на мгновение закружилась голова, и я понял, почему мне пришлось выйти на сцену за две недели до шоу. Однако сейчас я пытаюсь взглянуть на себя немного сверху и наслаждаться этим, прожить этот момент так, как мне хочется". сказал Йоци. "Конечно, я хочу достичь наилучшего результата, у меня есть соревновательный дух", добавляет он. "Основная идея песни заключается в том, что в этом быстро меняющемся мире мы должны замедлиться, и мы должны уделять пристальное внимание нашим любимым и проявлять нашу любовь в настоящем, потому что, если мы потеряем их, это может оставить очень большую рану", - сказал певец. В эти дни также было снято техническое видео сценического номера для представления в ЕВС и режиссерам конкурса для предварительной работы над сценическим выступлением. В целом, постановка будет похожа на ту, что уже была показана на A DAL 2019, с другой стороны, Тель-Авив предлагает гораздо более масштабную сцену, и там будут доступны множество новых технических решений, поэтому необходимо адаптировать номер. В воскресенье Йоци отправится в Тель-Авив, чтобы снять свой посткард для Евровидения. В минувшие выходные представитель Литвы Юриюс отправился в Швейцарию, где встретился с авторами песни Run With The Lions. "Я поехал в Швейцарию в воскресенье вечером, один из авторов песни, Пеле Лориано, который живет в Швейцарии, встретил меня там. А другой автор песни, Эрик Люмьер, приехал специально из Лос-Анджелеса. Они не теряют время - если вы начали работать - то сразу с полным загрузом. На этот раз, только Эшли Хиклин, который живет в Эдинбурге, не смогл присутствовать, но с ним я записал первую версию песни". Артист говорит, что записать песню - тяжелая работа. "Все должно было быть переписано - в каждой вокальной партии было много разных исправлений. Мы записывали, может быть, 9 часов и еще 4 - мы сели и выбирали вокал. Мне тоже пришлось сесть на кушетку в студии", говорит представитель Литвы. Хотя песня "Run With The Lions" была написана опытными профессионалами, Юриюс был удивлен их простотой и заботой. "Мне очень понравилось, что они обычные люди, хотя, смотря на то, сколько они делают, и сколько в этом году у них будет песен на Евровидении, они должны вести себя, как всемирно известные звезды. Помимо меня, они принимали участие в песнях Германии, Великобритании и Швейцарии. Они - профессионалы высшего уровня - перед каждой записью был долгий перерыв, мы обсуждали каждое слово песни - и как лучше передавать эмоции. Им важно, как чувствует себя исполнитель. Не секрет, что все стоит денег, ничто не бесплатно, но деньги - это третье или четвертое, для них важнее то, как ты себя чувствуешь, когда поешь, и что можно улучшить", - добавляет певец. Песня будет звучать совершенно по-новому. "Вы действительно можете ожидать новое звучание. Мы создали новую среднюю часть песни, и она будет намного более мощной. Люди, комментирующие песню, часто говорили, что она не имеет развития, поэтому мы вместе с авторами подумали, что же мы можем сделать". Юриюс говорит, что решил обновить песню не только из-за внешнего давления - идея перемен родилась вместе с авторами песни в Швейцарии. Юриюс понимает, что ему предстоит еще много тяжелой работы, но он определенно улучшит свой вокал, чтобы достичь наилучшего результата. "Я тренируюсь дома, но перед тем, как отправиться в Израиль, я еще буду работать с педагогом по вокалу Викторией Калпокайте. Она - настоящий вокальный специалист, который помог мне не только вокально, но и эмоционально, потому что это оказывает большое влияние на пение и выступление, потому что ты поешь телом, а не голосом. Нам всем нужно работать - и мне, и моим замечательным пяти бэк-вокалистам", - уверяет он. Юриюс будет участвовать в промо-вечеринках в Лондоне, Амстердаме и Мадриде. Он говорит, что не заинтересован в самих вечеринках и тусовках, но для него важны концертные выступления. Юриюс собирается представлять себя за границей под несколько более коротким именем, потому что заметил, что иностранцам трудно произносить его настоящее имя. "Я представлюсь по-другому, сокращенным именем. Я слышал, что мое имя произносится как "jury juice", поэтому я научу всех его сокращать", - смеется представитель Литвы. Премьера песни Армении Walking Out пройдет в воскресенье, в 20:45 Москвы. Представлена конкурсная песня Северной Македонии - Тамара Тодевска - Proud. Песня Мальты для Евровидения 2019 будет представлена в воскресенье в 20:00 Москвы. Конкурсная песня была выбрана из более чем 300 представленных песен. После записи нескольких демо-версий, несколько фокус-групп и отраслевые эксперты проголосовали за финальный выбор. В данной композиции Микела продемонстрирует другую сторону своего разнопланового таланта. Микела Пач - победитель первого выпуска шоу X Factor Malta. В конкурсе приняли участие более 500 претендентов, и ему удалось собрать рекордную аудиторию для Мальты, насчитывающую более 200 000 зрителей, с беспрецедентным количеством в 132 000 голосов, которые определили победителя. Впервые победитель X Factor будет представлять Мальту на конкурсе Евровидение. Наставник X Factor Говард Кит говорит, что Микела продемонстрировала на конкурсе, что она не уклоняется от вызовов. Предсказуемость не является частью ее словарного запаса, и эта песня покажет другую сторону Микелы ... готовьтесь к переменам. Другая судья X Factor Ира Лоско говорит: "Когда я впервые увидела, как Микела поет эту песню, я была просто поражена тем, насколько она готова измениться и показать нам еще одну свою сторону. Микела - артист на все 360 градусов. Мне очень нравится эта песня и ее запоминающийся голос". Известный местный музыкальный продюсер Элтон Зарб, который входил в состав фокус-групп, помогающих PBS выбрать песню, назвал ее "Дыханием свежего воздуха - блестящей песней". Представлена конкурсная версия трека Tulia - Pali Się (Fire Of Love). Pali Się (Fire Of Love) - третья оригинальная песня, которая появилась на платиновом дебютном альбоме Tulia. Это один из самых мощных и энергичных треков на диске. Некоторые могут услышать в нем рок-музыку, вдохновленную работой Led Zeppelin, или звуки, известные по альбомам The White Stripes. С этим треком Tulia еще раз доказывают, что они не боятся экспериментировать, смешивая тяжелую рок-атмосферу с элементами фолка. Видеоклип был навеян номинированным на Оскар фильмом "Холодная война" режиссера Павла Павликовского. 27-летний певец-композитор Чингиз Мустафаев отправится на сцену Евровидения в Тель-Авиве, чтобы представить Азербайджан с песней "Truth". В январе "Truth" победила в закрытом национальном отборе песен, организованном общественным телевидением Ичтимаи, оставив позади более 350 других композиций. Чингиз изменил свой художественный подход к конкурсу Евровидение 2019. Truth современна, радийна и несет личностный характер. Его выступление в Тель-Авиве станет серьезным отходом от его вдохновленных фламенко композиций. Truth повествует о нечестных, отравляющих отношениях. В песне рассказывается об истории одного из партнеров, который предает другого, оставляя перед ним трудный выбор: принять обман или освободиться от ложных иллюзий. Болгарско-австрийский автор песен Борислав Миланов написал "Truth". Он говорит: "Изначально я немного нервничал из-за того, как Чингиз будет исполнять песню, так как он из другой музыкальной среды. Но встреча с ним полностью изменила мое мнение. Он так страстно увлечен музыкой и своей национальной культурой. Мы даже добавили некоторые уникальные элементы традиционной азербайджанской музыки, которые блестяще сработали ради того, чтобы сделать песню подлинным сплавом Азербайджана и Запада"..
Состоялась премьера видеоклипа Чехии - Lake Malawi на песню Friend of a Friend. Презентация песни Сергея Лазарева для Евровидения 2019 пройдет в субботу, 9 марта, в 19:00 Москвы, сообщил исполнитель в своем инстаграм аккаунте. "Я очень надеюсь, что вы все полюбите эту песню также сильно как я её полюбил, когда услышал в первый раз. Это новый удивительный эксперимент для меня, и я очень рад что он состоялся. Спасибо, дорогой Филипп Киркоров не только за твой музыкальный вклад в песню, но, прежде всего за то , что ты всегда рядом со мной, как брат. Настоящая дружба существует в Шоу-бизнесе и ты лучший пример этого. Спасибо, Димитрис Контопулос за эту мощнейшую мелодию, великолепный продакшн и все часы работы, которые ты потратил на эту песню. Спасибо Шарон Вон, Ваш текст придал смысл потрясающей мелодии. Для меня большая честь работать с Вами. Андрей Коноплев - ты лучший звукорежиссер , с которым я когда-либо работал в студии. Алекс Панайи, спасибо за твое терпение , ты настоящий профессионал. Большое спасибо телеканалу "Россия" и Геннадию Борисовичу Гохштейну за то, что во второй раз доверили представлять нашу страну. Я Обещаю, что сделаю все возможное, чтобы достойнейшим образом представить Россию на конкурсе Евровидение 2019 в Израиле в мае. Итак, релиз песни завтра !! Наберитесь терпения и пожалуйста дождитесь официального релиза !!! Осталось ждать чуть-чуть! Уважайте труд большой команды, которая несколько месяцев готовила эту премьеру! Спасибо за понимание! "Tears aren't quiet things..." #sergeylazarev #сергейлазарев #eurovision2019 #Россия"
Ирландский вещатель RTÉ объявил артиста и песню, которые будут представлять Ирландию на Конкурсе Песни Евровидение 2019. Сара Мактернан, занявшая третье место в "Голосе Ирландии" в 2015 году, будет представлять Ирландию на конкурсе этого года с запоминающейся песней под названием 22. Трек был написан голландскими авторами Janieck, Marcia Sondeijker и Roulsen. После своего участия в "Голосе Ирландии" 2015, Мактернан работала визажистом в Лимерике, родив два с половиной года назад дочь, и сформировав группу The Jeds для выступления на свадьбах. Она безуспешно боролась за право представлять Сан-Марино на прошлогоднем Евровидении. Мактернан рассказала RTÉ, что экстрасенс предсказал ей много лет назад, что она появится в большом телешоу, у нее будет дочь и всплеск ее карьеры, когда ей будет 24 года. Все три предсказания уже сбылись. На национальный отбор Ирландии Сара представила песню авторства шведских авторов Ильвы и Линды Перссон. Продюсерам понравился ее голос, но не ее песня, и, в свою очередь, им понравилась заявленная песня "22", но нее ее исполнительница. Когда они обнаружили, что Мактернан - ирландка, ей предложили записать другую песню. "После того, как мне позвонили, я танцевала по всему дому. Я была так взволнован. Как певец, конечно, каждый хочет представлять свою страну", - сказал Мактернан. Глава делегации RTÉ Майкл Кили говорит, что "нет сомнений в том, что Сара обладает звездным качеством" и "очень своеобразным голосом". "Когда вы слушаете 430 голосов, поверьте мне, вы знаете, что значит незабываемый голос. Мы попросили ее пройти прослушивание, чтобы спеть новую песню. И мы были немного потрясены", - сказал он. "За пределами свадебных церемоний в Эннисе и Клэр, где она живет, большинство людей не будут с ней знакомы. Мы позвали ее на прослушивание перед камерой и поняли, что она очень уверенная исполнительница". 24-летняя певица из деревни Скарифф в графстве Клэр, говорит, что быть избранной представлять Ирландию на столь любимом конкурсе - "это как немного ранний подарок на день рождения" "У меня 25-й день рождения в следующий понедельник, и если бы вы сказали мне в прошлом году, что я буду выбрана представлять свою страну на Евровидении, я впервые исполню песню на "Танцах со звездами" в это воскресенье, а затем вылечу в Тель-Авив, в свой день рождения, чтобы снять там посткард - я бы сказала вам - вы сошли с ума!". Сара говорит, что ее семья, включая ее маленькую дочку Миа, "очень взволнована" предстоящим путешествием, в которое она отправляется. "Моя мама, бабушка, семья и друзья очень рады за меня - они в шоке и очень горды мною. Я не могу дождаться, чтобы научить свою самую большую поклонницу - мою двух с половиной летнюю дочь Мию - тексту на песню 22!". О том, как она услышала песню в первый раз, Сара рассказывает: "Когда я впервые услышала ее, я просто подумала, что она очень запоминающаяся. Она очень легко ложится на слух. Она выдержана в стиле поп и весьма актуальна. Это действительно сильная песня для Евровидения". Видео на трек было снято на Dollymount Strand Кристианом Тирни, который работал с такими артистами, как Hozier, Niall Horan, The Weeknd, Macklemore, Demi Lovato, Kendrick Lamar, Drake и The 1975. Несмотря на холодную температуру в день съемок, Сара говорит, что это все было "очень весело", и пошутила, что она надеется, что никто не заметит, как она делает "движения папы". "Я просто замерзла. Я не могла двигаться, поэтому я немного неуклюже делала dad dancing, надеюсь, это не будет слишком очевидно", - смеется она. Сара впервые выступит с песней "22" на "Танцах со звездами" на RTÉ One в воскресенье 10 марта в рамках специальной программы на тему "Евровидения", в которой также будет выступать легенда Евровидения Джонни Логан. Конкурсная песня представительницы Австрии PÆNDA - Limits только что была представлена в рамках радиопрограммы Ö3-Wecker. "Limits" - не обычная приятная поп-песня. Вы должны вовлечься, чтобы понять ее. Она протекает мягко, но интенсивно, очень современна на вид, почти авангардна, и очаровывает прежде всего завораживающим пением Pænda, которое легко поднимается до самых высоких высот и изящно плывет над заниженным битом. В любом случае, Австрия представляет себя на Евровидении очень перспективно и очень современно. ORF полагает, что выход в финал должен быть вполне осуществимым с этой песней. Особенно в рейтинге экспертного жюри, которое действительно отличается своим изысканным музыкальным вкусом, Пенда должна набрать большие очки - однако от зрителей, которые могут отвлечься на то или иное изумление дома на диване, голоса могут быть довольно скудны. Потому, мечтой 31-летней певицы является то, что режиссер крупнейшего музыкального шоу в мире разместит ее выступление во 2-м полуфинале между двумя актами, которые сопровождаются пронзительным, громким, типичным Евровизионным выступлением. Пенда готова к своему большому выступлению в Израиле. На сцене Конференц-центра в Тель-Авиве, вероятно, появится только сама певица, которой будут помогать бэк-вокалисты - правда им не обязательно самим быть в центре внимания. Окончательная постановка будет разработана в течение следующих нескольких недель. Она не нервничает. Скорее позитивно взволнована, мотивирована до самых голубых кончиков волос и полна предвкушения приключений в ее жизни. Благодаря написанной ей самой песне у нее теперь есть прекрасная возможность заявить о себе, как о музыканте по всей Европе. Pænda - шоу одной женщины. Она пишет и сочиняет свои собственные песни, сама играет на всех инструментах, а также продюсирует свои песни. И очень грамотно: 26 апреля она выпускает свой новый альбом "Evolution II", в который войдет и "Limits", и таким образом использует - вполне законно - Евровидение в качестве рекламной платформы. Если ее план сработает, то только небо - ее предел.